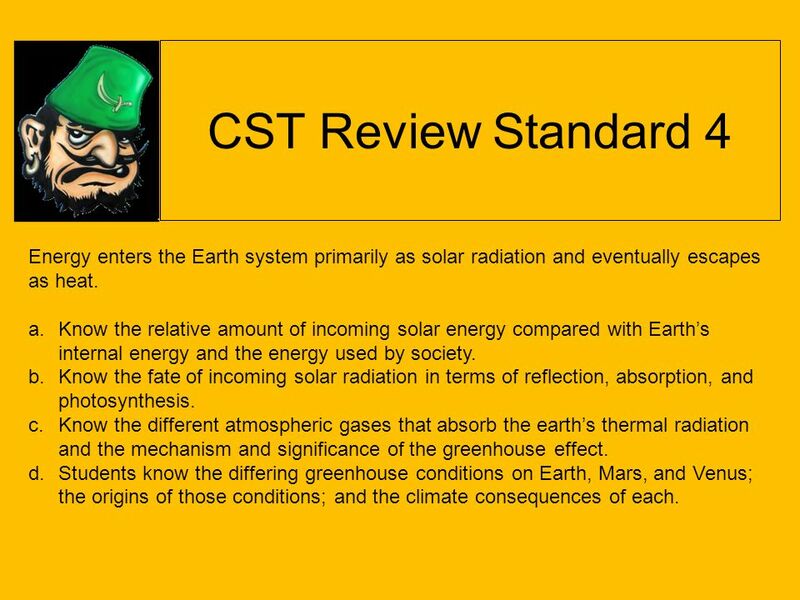 CST Review Standard 4 Energy enters the Earth system primarily as solar radiation and eventually escapes as heat. Know the relative amount of incoming. 1 CST Review Standard 4 Energy enters the Earth system primarily as solar radiation and eventually escapes as heat. Know the relative amount of incoming solar energy compared with Earth’s internal energy and the energy used by society. 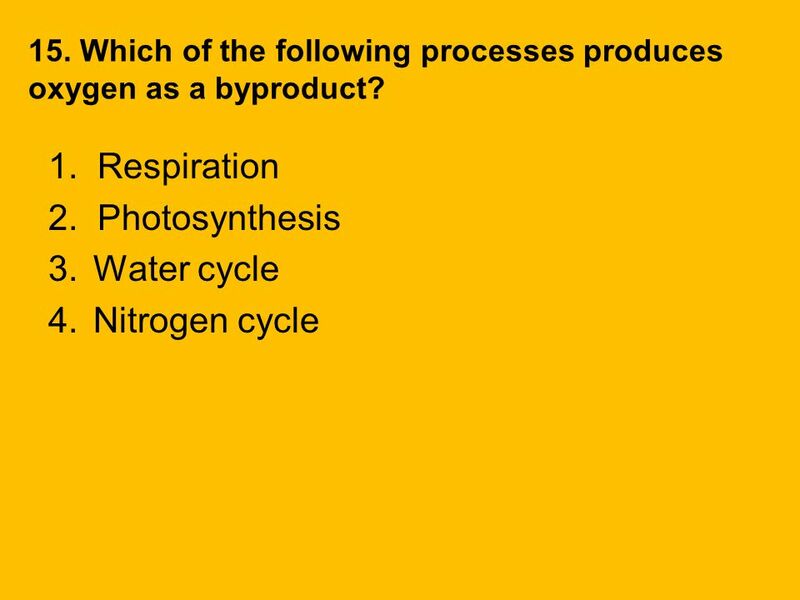 Know the fate of incoming solar radiation in terms of reflection, absorption, and photosynthesis. 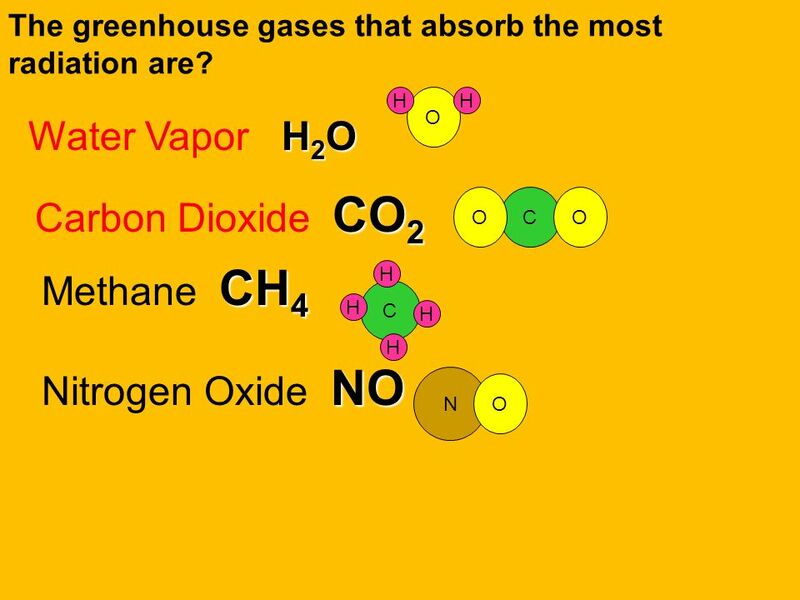 Know the different atmospheric gases that absorb the earth’s thermal radiation and the mechanism and significance of the greenhouse effect. 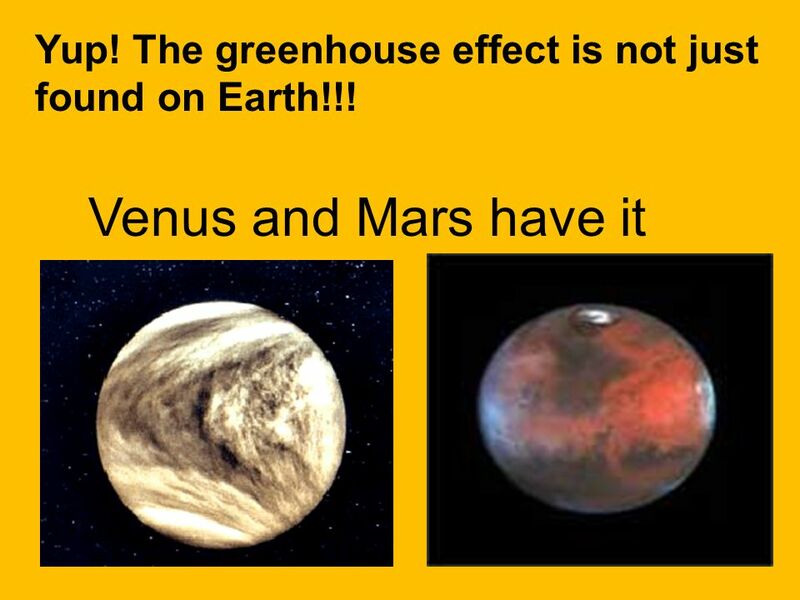 Students know the differing greenhouse conditions on Earth, Mars, and Venus; the origins of those conditions; and the climate consequences of each. 3 1. 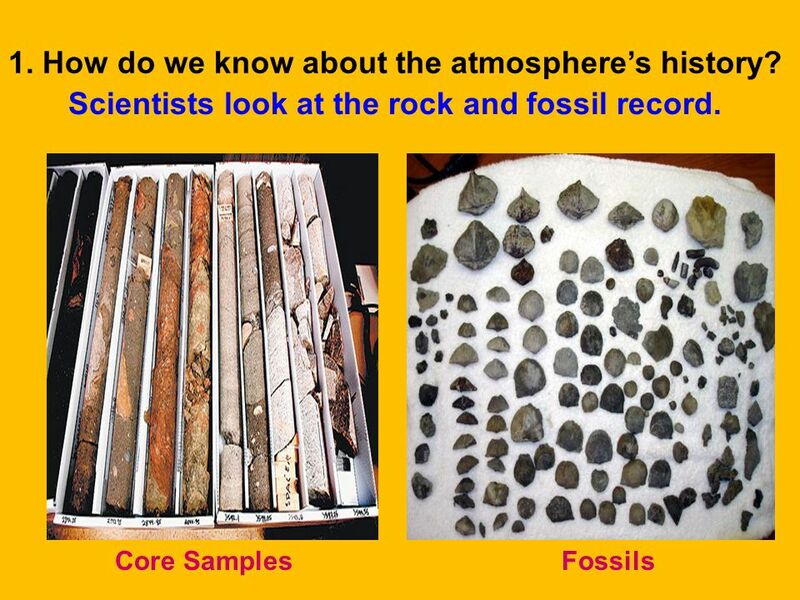 How do we know about the atmosphere’s history? 4 2. What happened to Earth’s very first atmosphere? 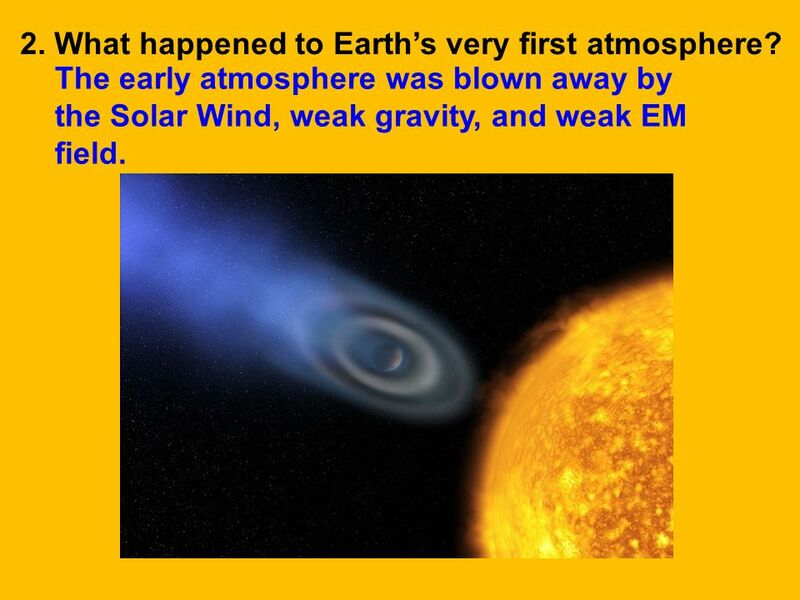 The early atmosphere was blown away by the Solar Wind, weak gravity, and weak EM field. 5 3. 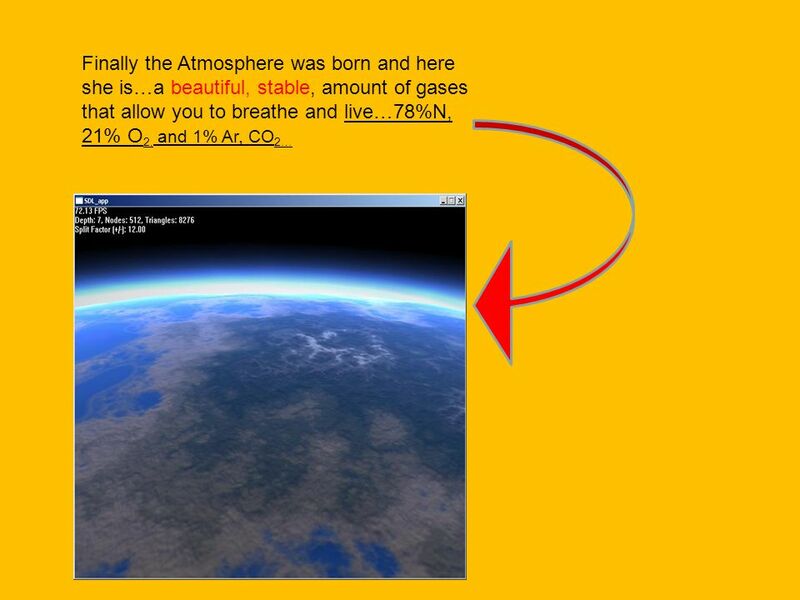 What caused the earth’s atmosphere to form? 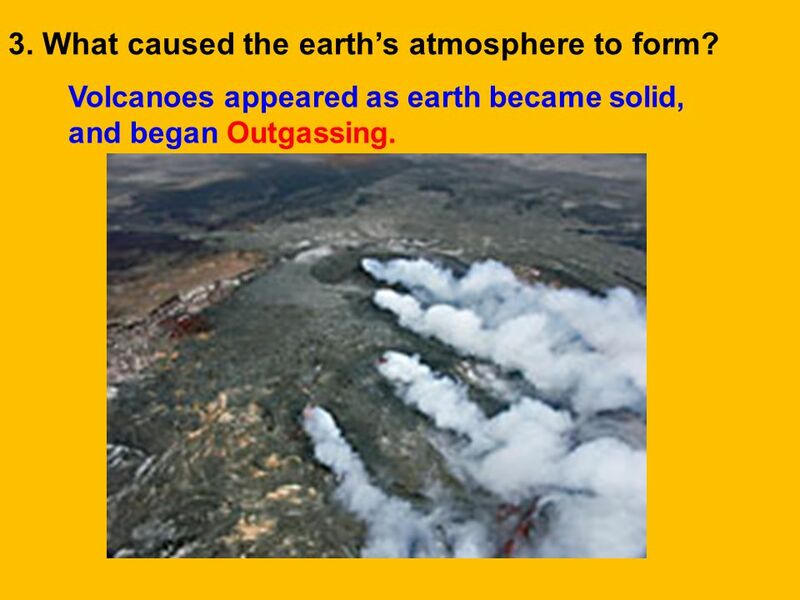 Volcanoes appeared as earth became solid, and began Outgassing. 6 4. 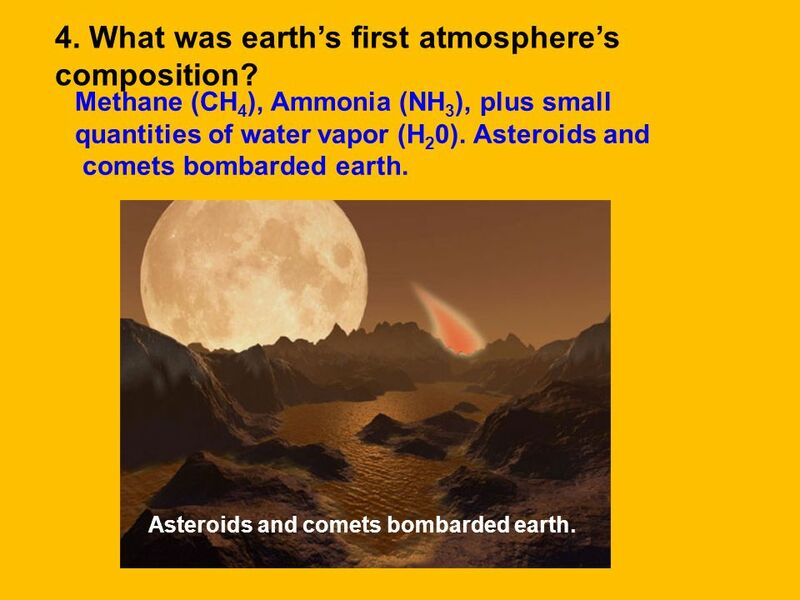 What was earth’s first atmosphere’s composition? 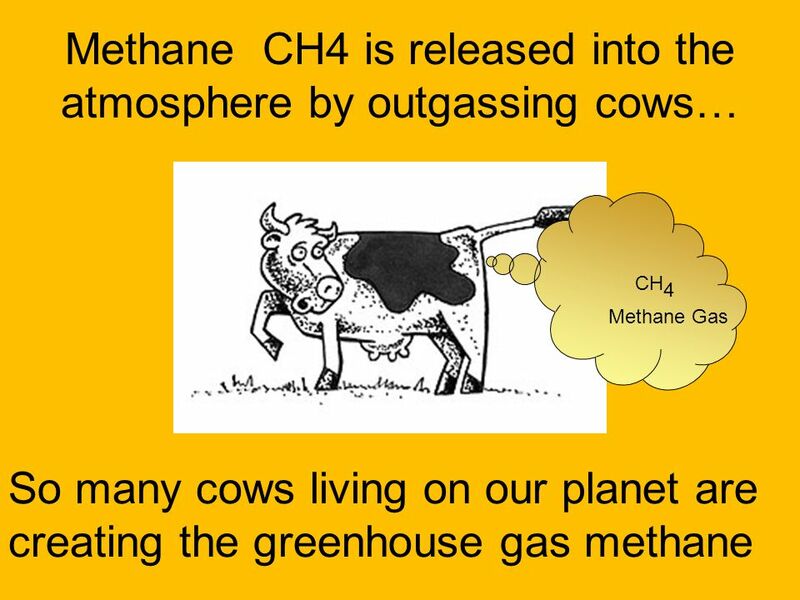 Methane (CH4), Ammonia (NH3), plus small quantities of water vapor (H20). Asteroids and comets bombarded earth. Asteroids and comets bombarded earth. 7 5. 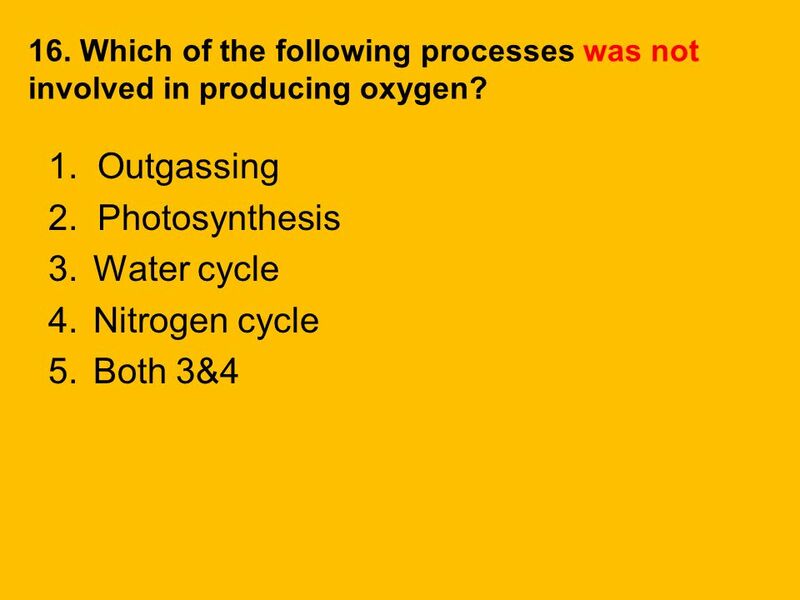 What is Outgassing? 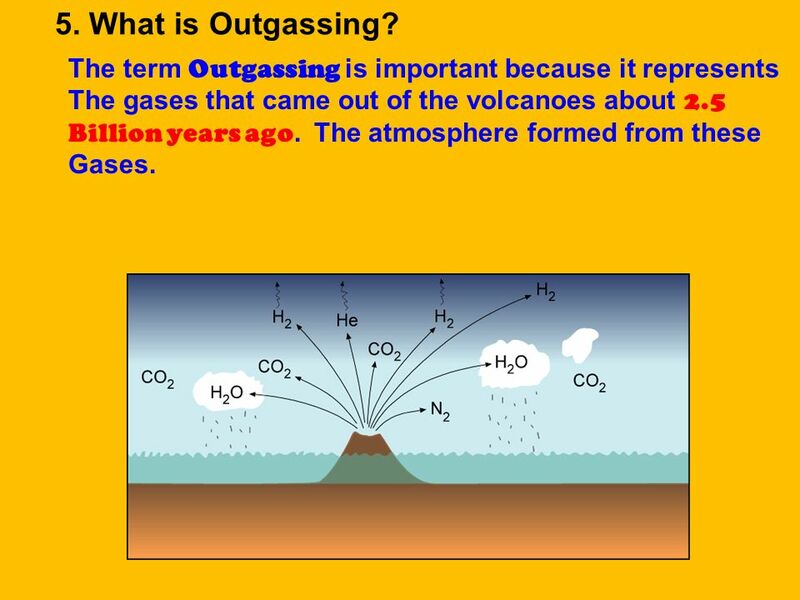 The term Outgassing is important because it represents The gases that came out of the volcanoes about 2.5 Billion years ago. 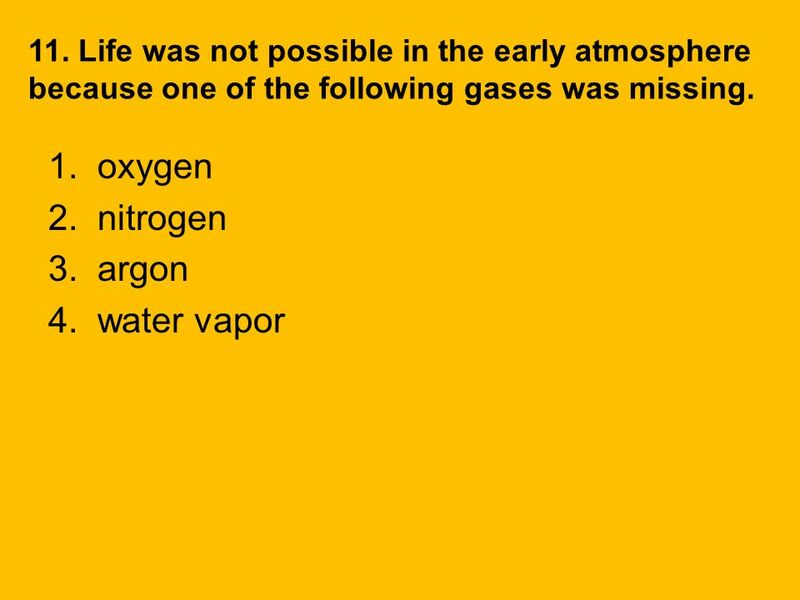 The atmosphere formed from these Gases. Asteroids and comets bombarded earth. 8 6. 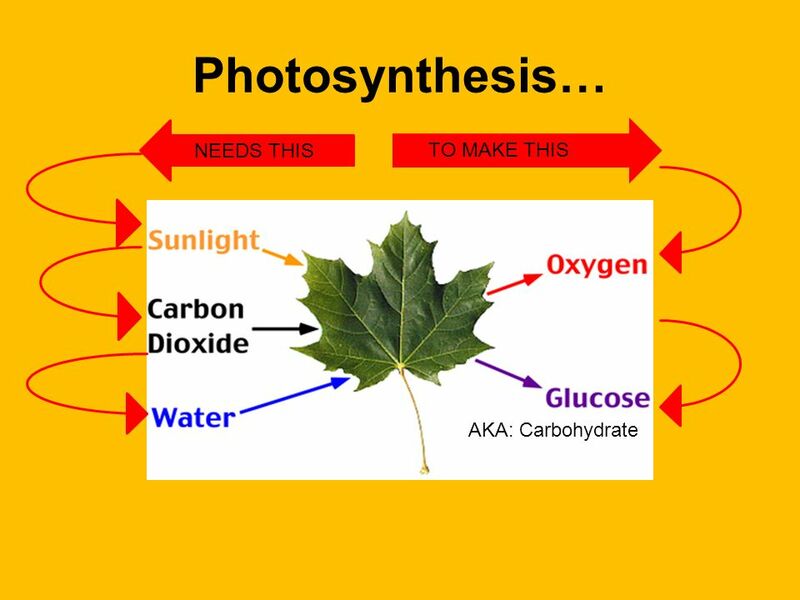 Since we had no plants as we know them today, what primitive plants are responsible for photosynthesis during the earth’s early atmosphere? 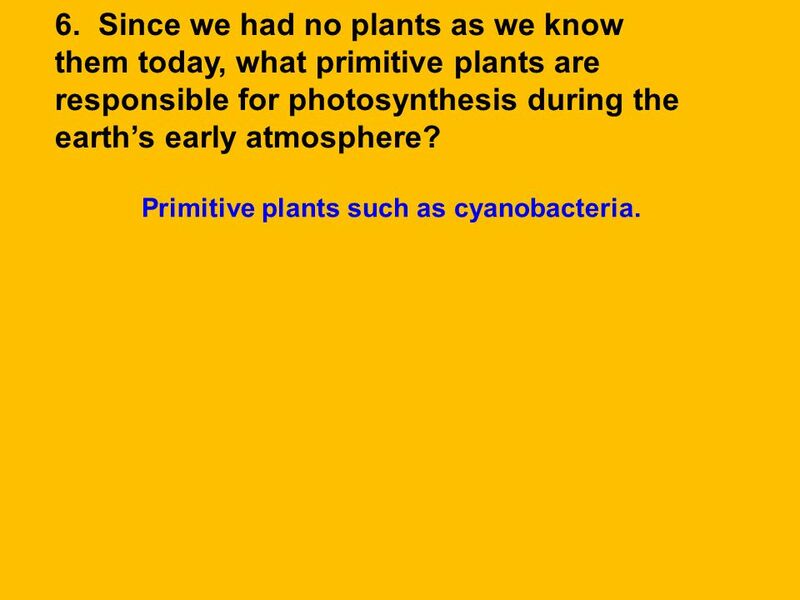 Primitive plants such as cyanobacteria. 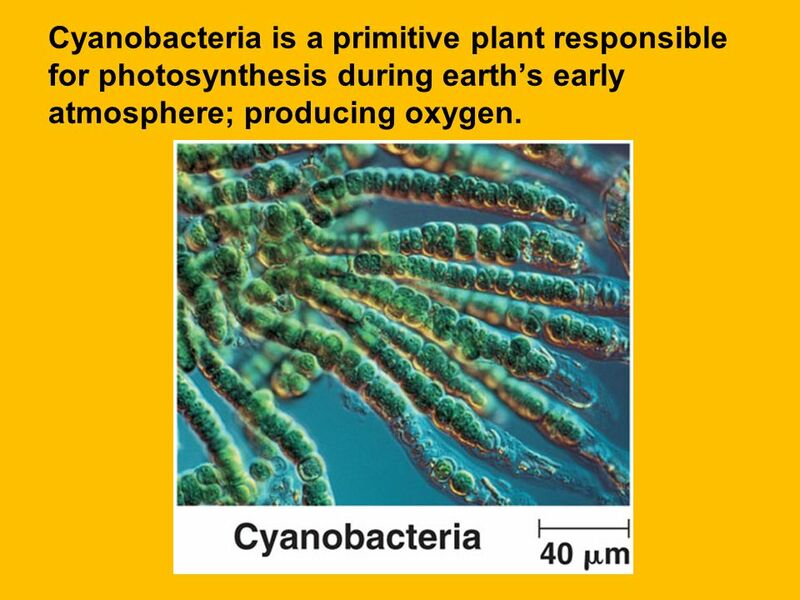 9 Cyanobacteria is a primitive plant responsible for photosynthesis during earth’s early atmosphere; producing oxygen. 10 7. What produced the oxygen we have today? 11 8. 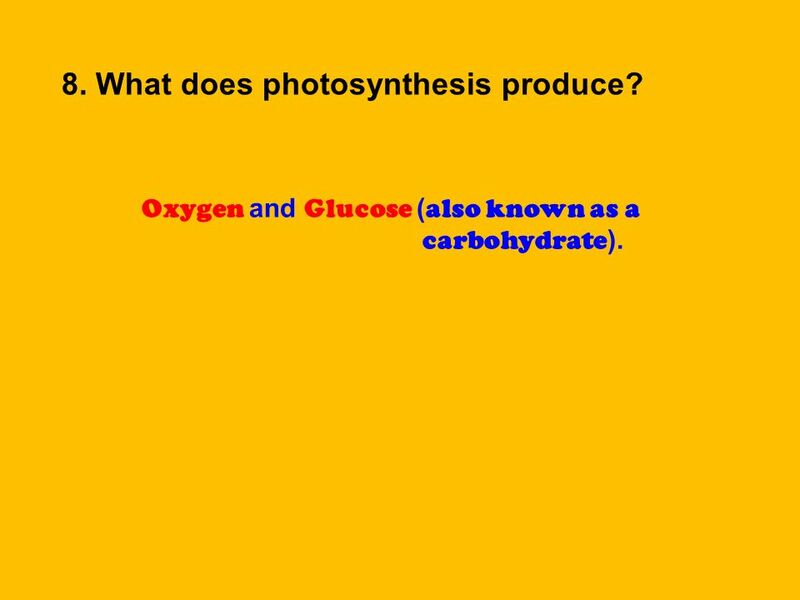 What does photosynthesis produce? 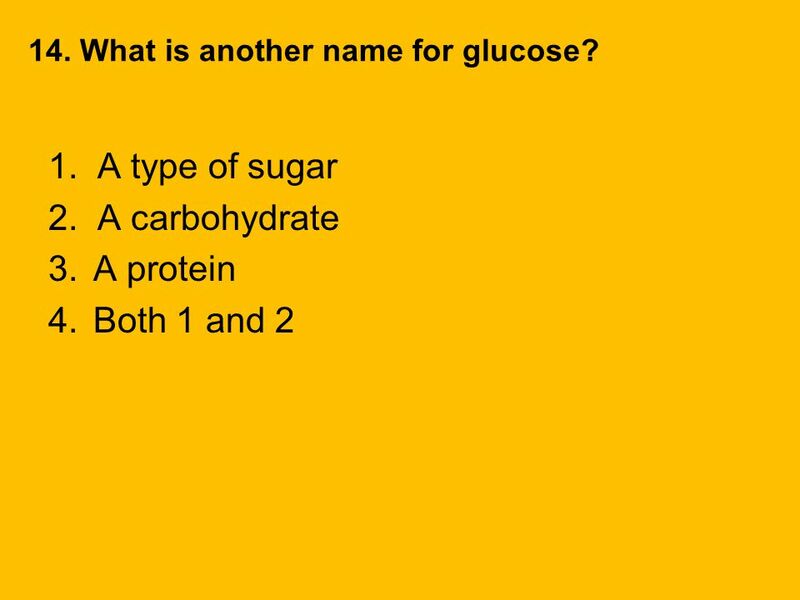 Oxygen and Glucose (also known as a carbohydrate). 13 9. 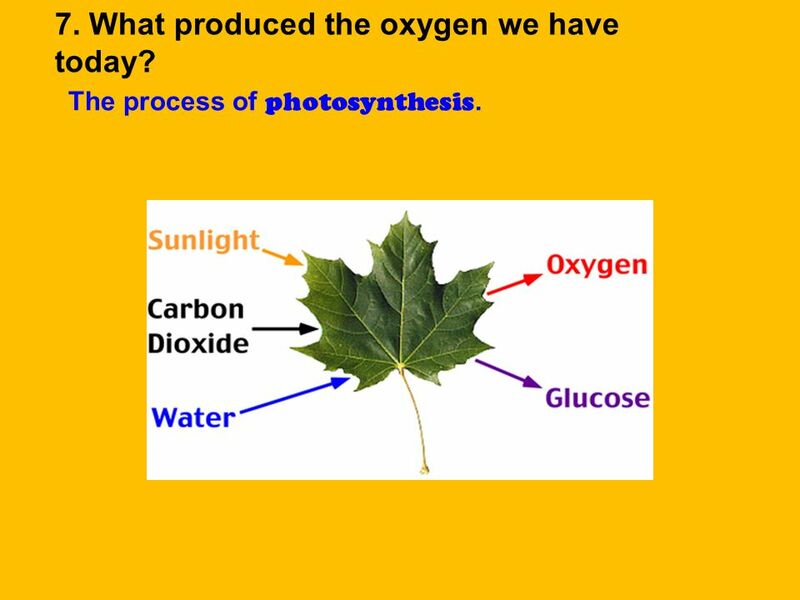 What does photosynthesis require to make oxygen and glucose? 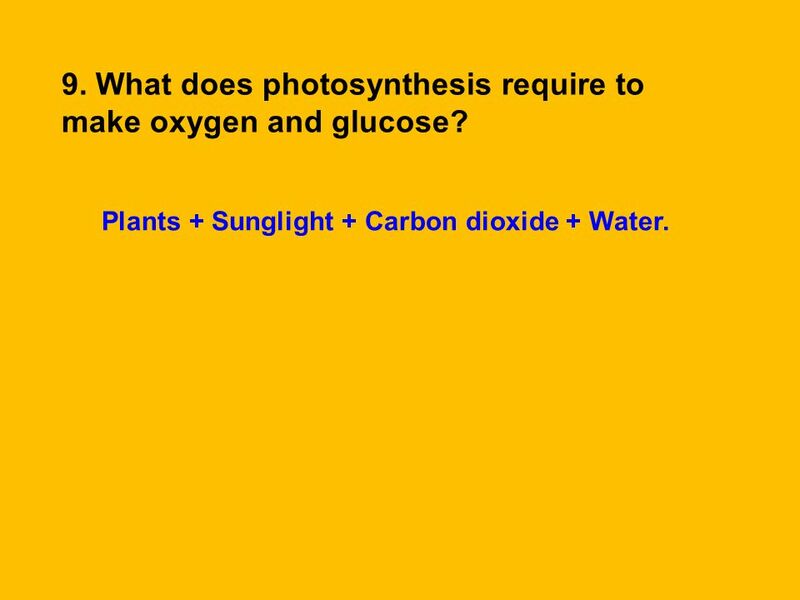 Plants + Sunglight + Carbon dioxide + Water. 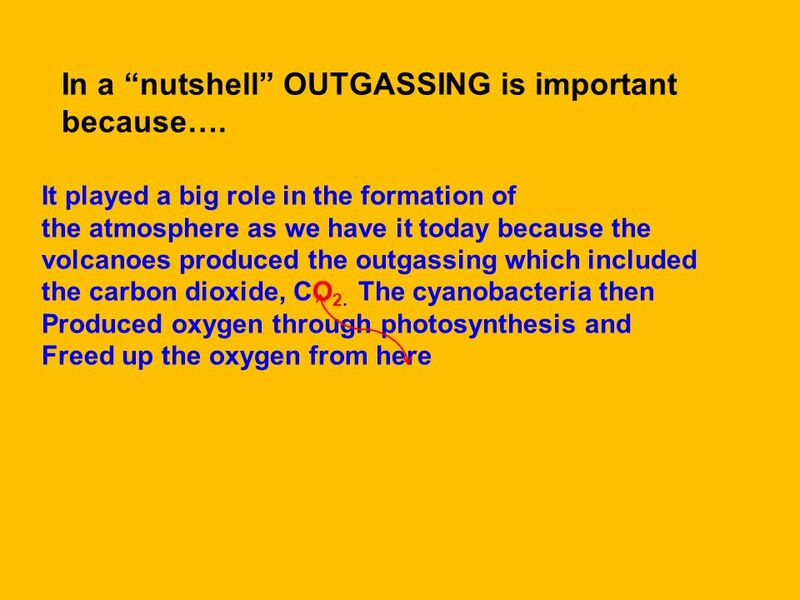 15 In a “nutshell” OUTGASSING is important because…. 18 9. 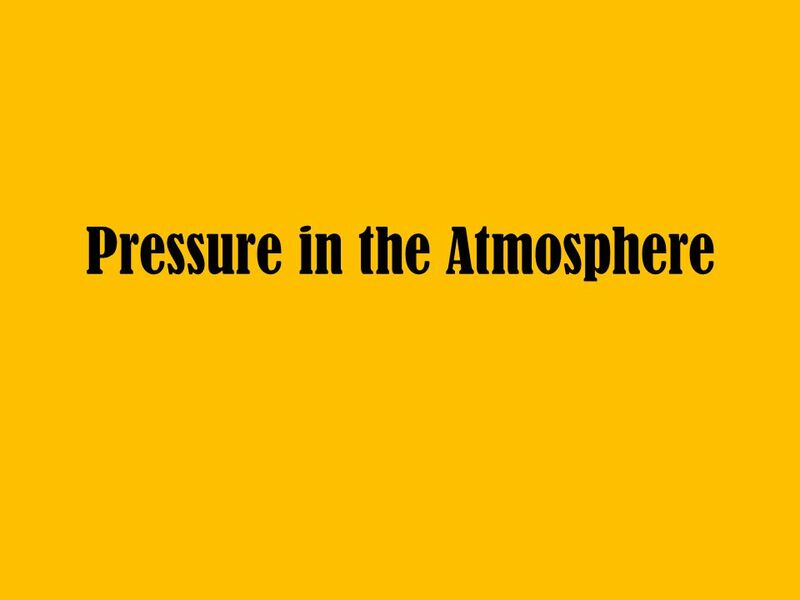 What is the atmosphere’s current composition? Do you remember the percentages? 27 17. 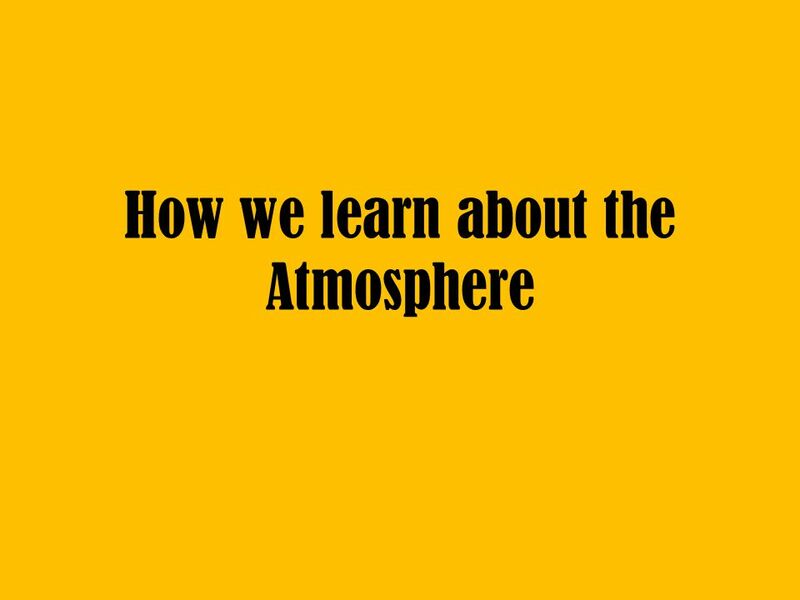 How do Scientist learn about the atmosphere? 29 18. 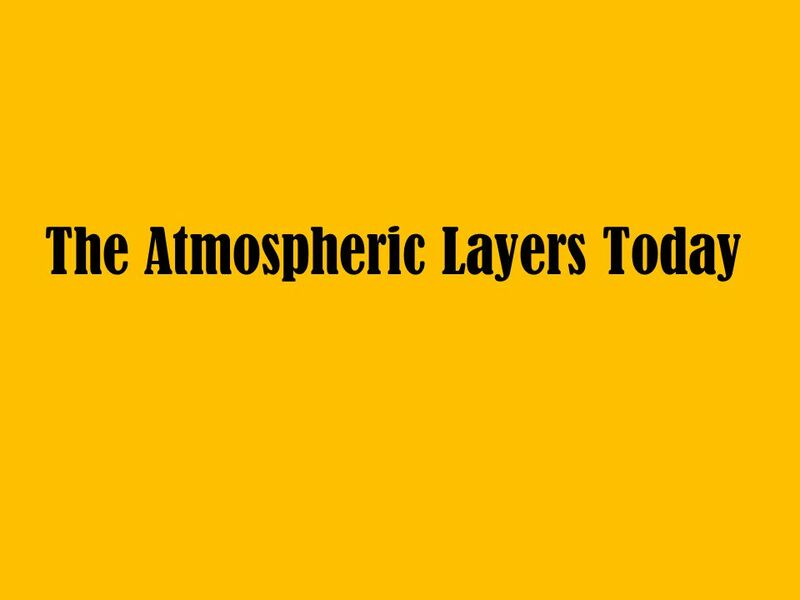 What are the layers of the atmosphere? 30 19. 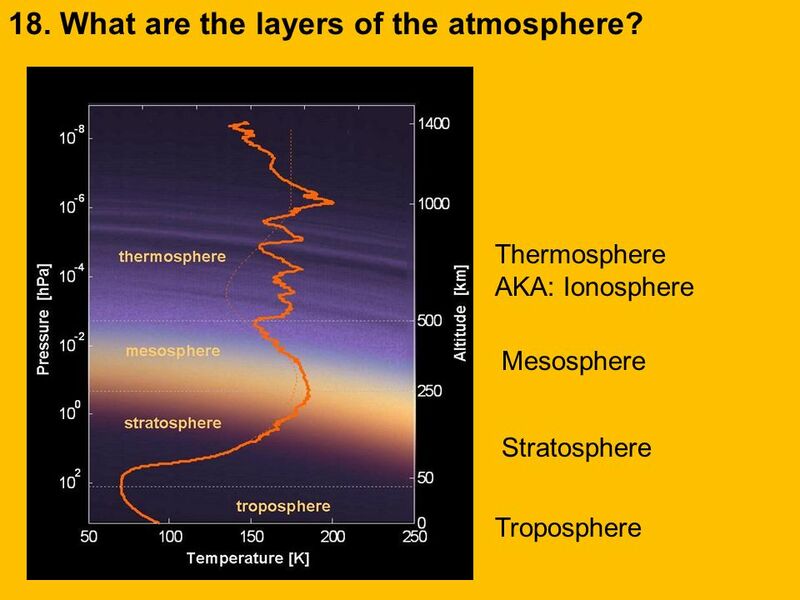 How are the atmospheric layers divided up? 31 20. 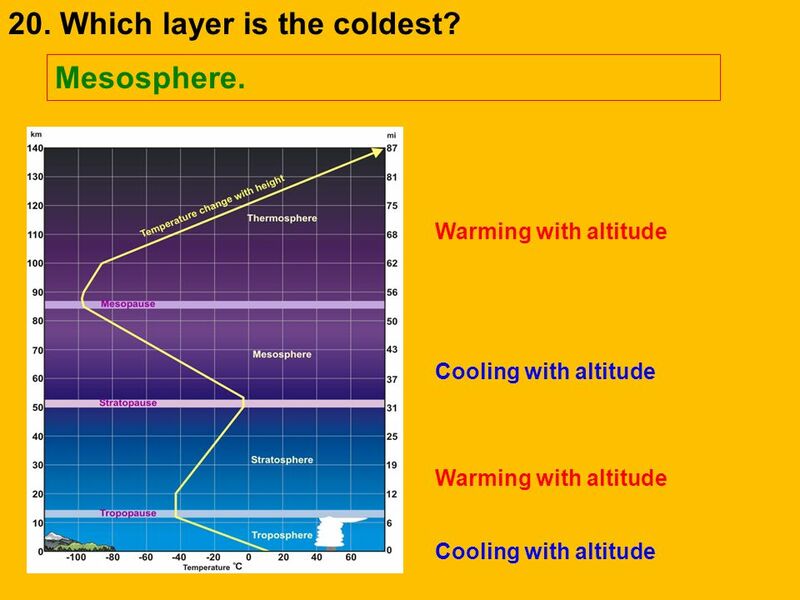 Which layer is the coldest? 32 17. Which layer is the hottest? 33 18. Which layer contains the ozone layer? 34 19. 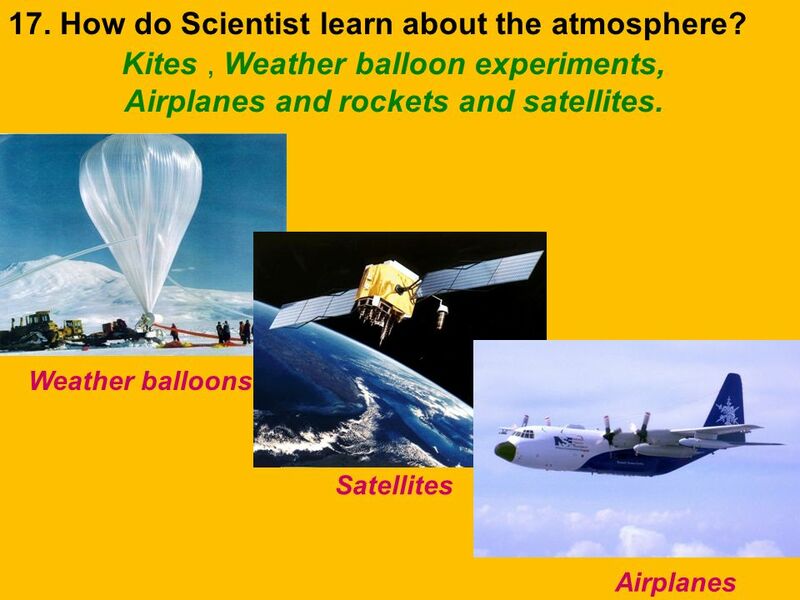 Why is the troposphere important? 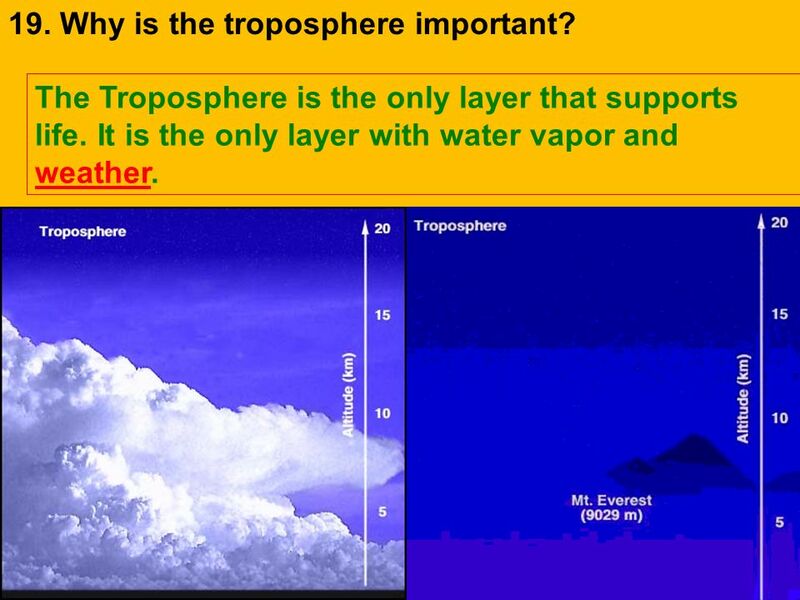 The Troposphere is the only layer that supports life. It is the only layer with water vapor and weather. 35 20. 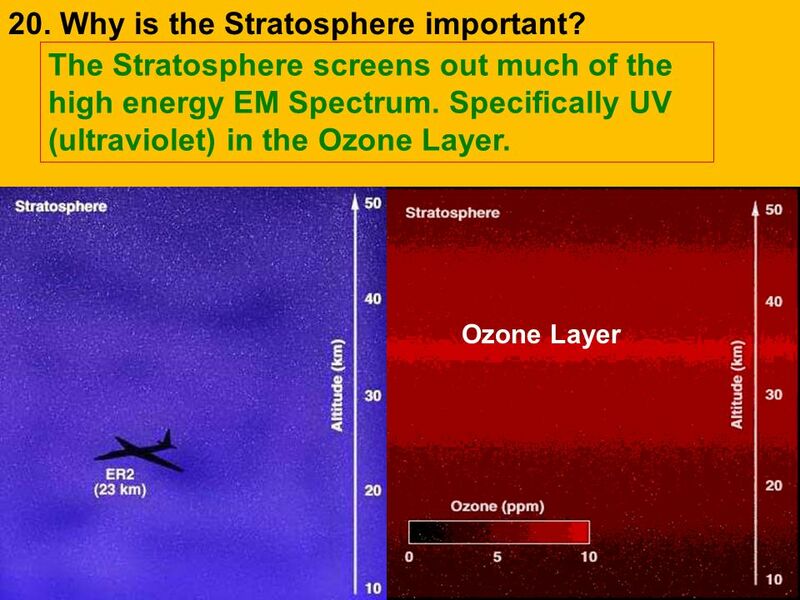 Why is the Stratosphere important? 37 21. 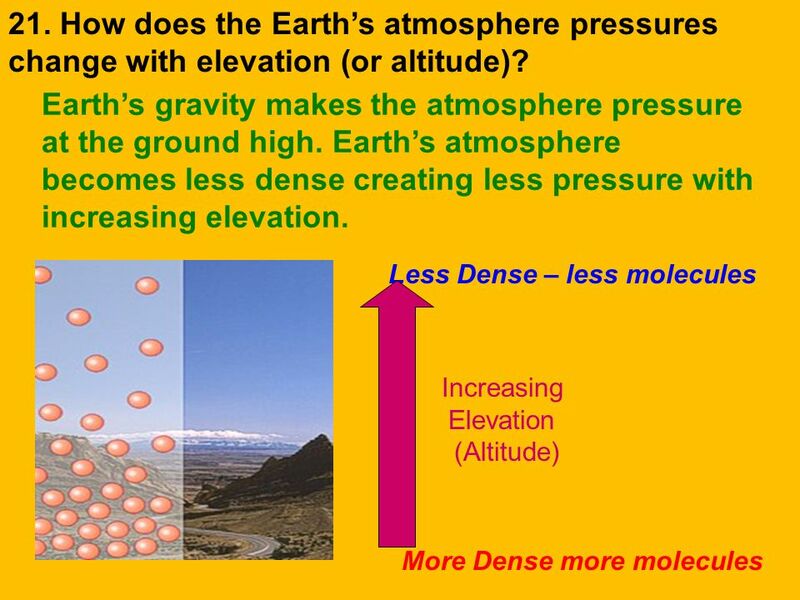 How does the Earth’s atmosphere pressures change with elevation (or altitude)? 39 Every object releases electromagnetic radiation! Our eyes see visible waves. 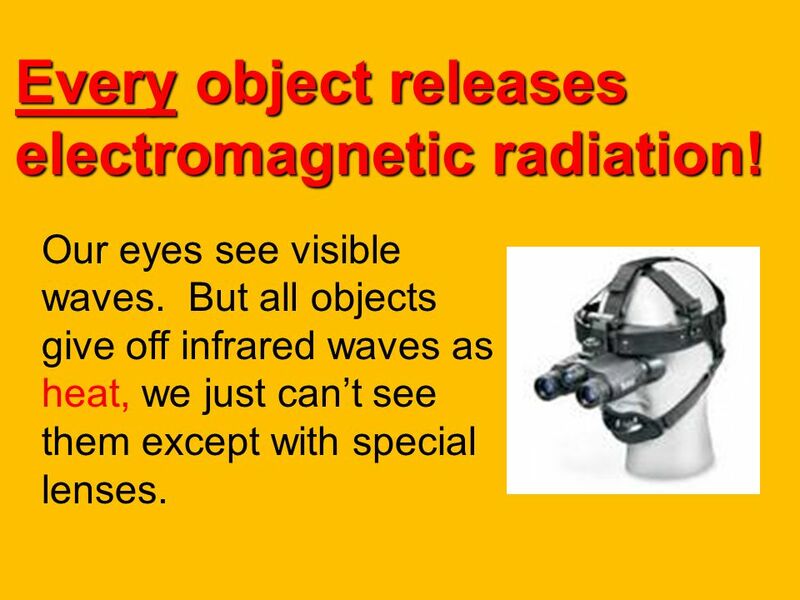 But all objects give off infrared waves as heat, we just can’t see them except with special lenses. 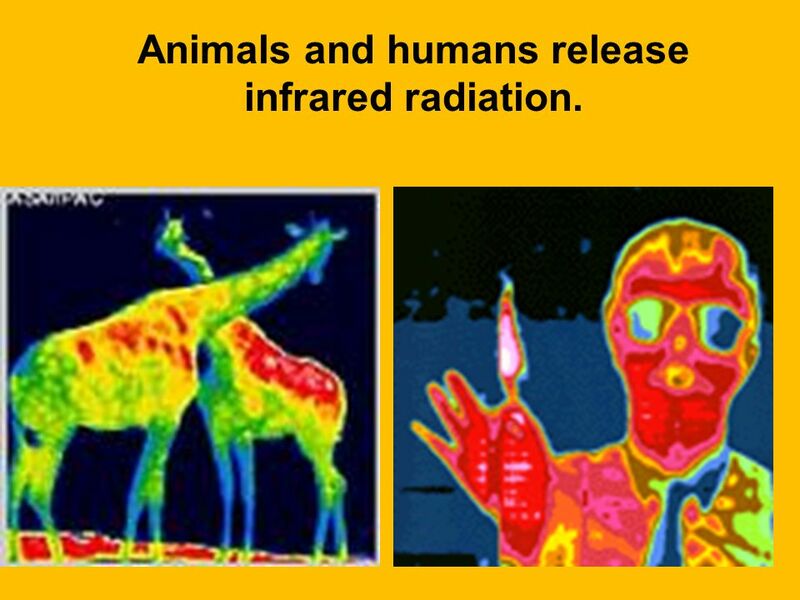 40 Animals and humans release infrared radiation. 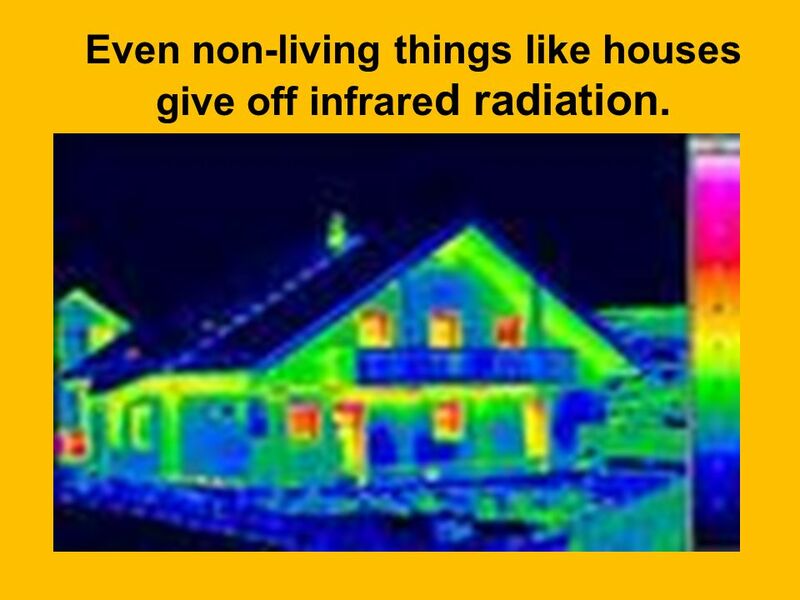 41 Even non-living things like houses give off infrared radiation. 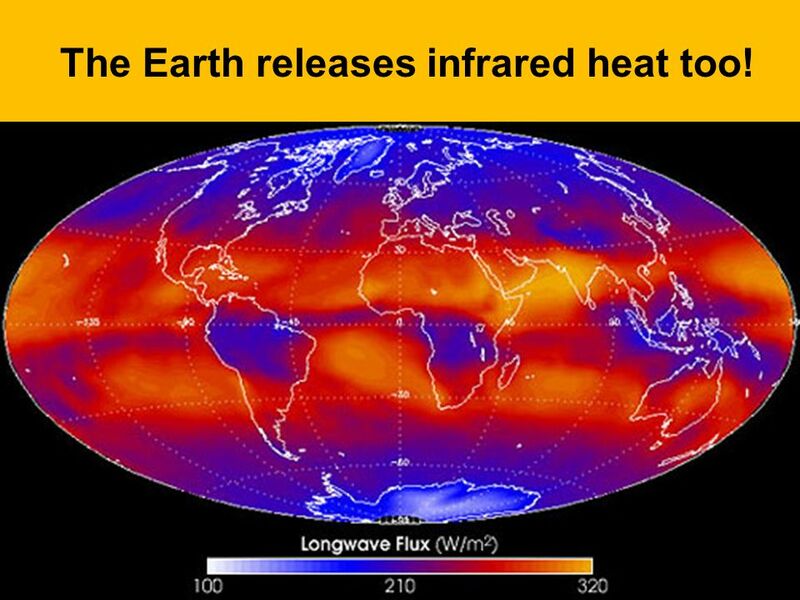 42 The Earth releases infrared heat too! 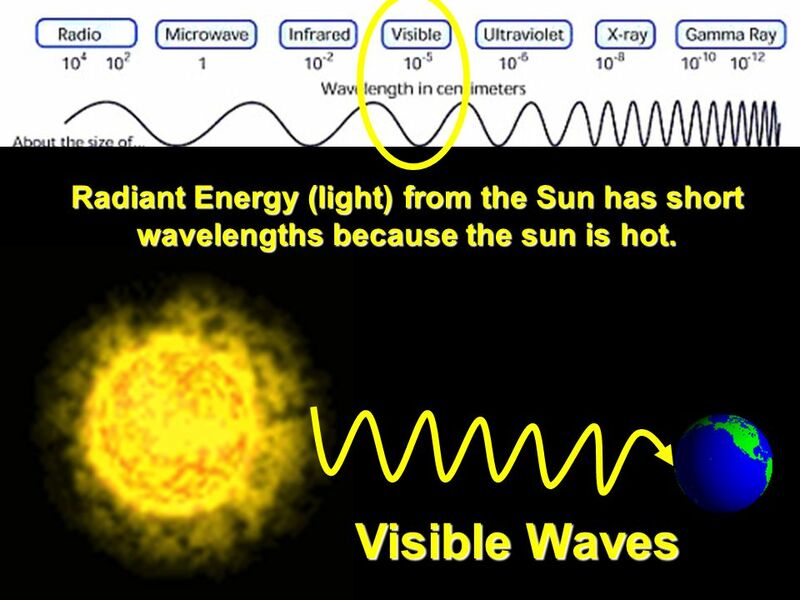 43 Radiant Energy (light) from the Sun has short wavelengths because the sun is hot. 44 The sun provides the most radiant energy than any other source. 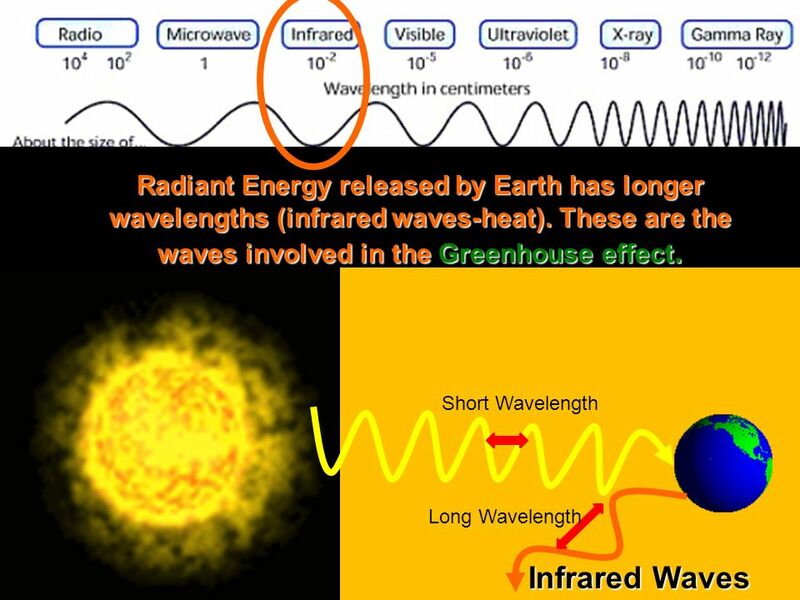 45 Radiant Energy released by Earth has longer wavelengths (infrared waves-heat). 46 22. 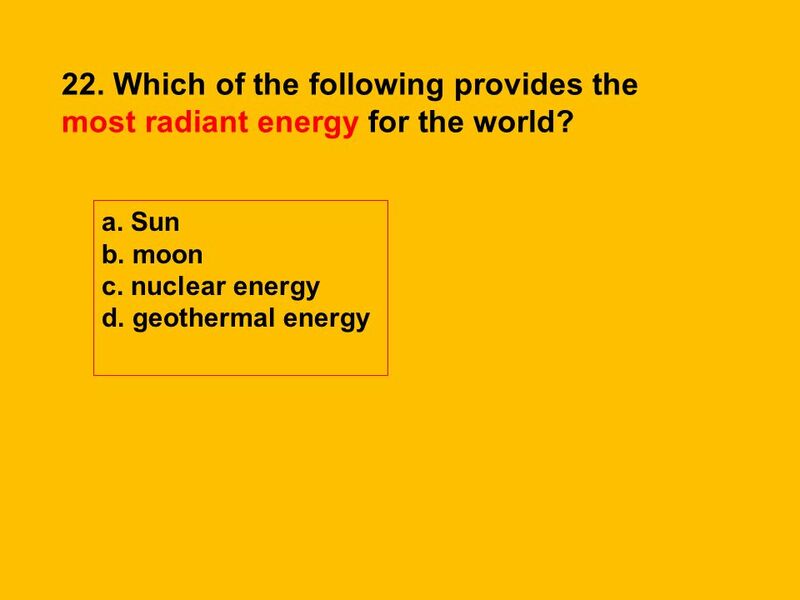 Which of the following provides the most radiant energy for the world? 47 23. 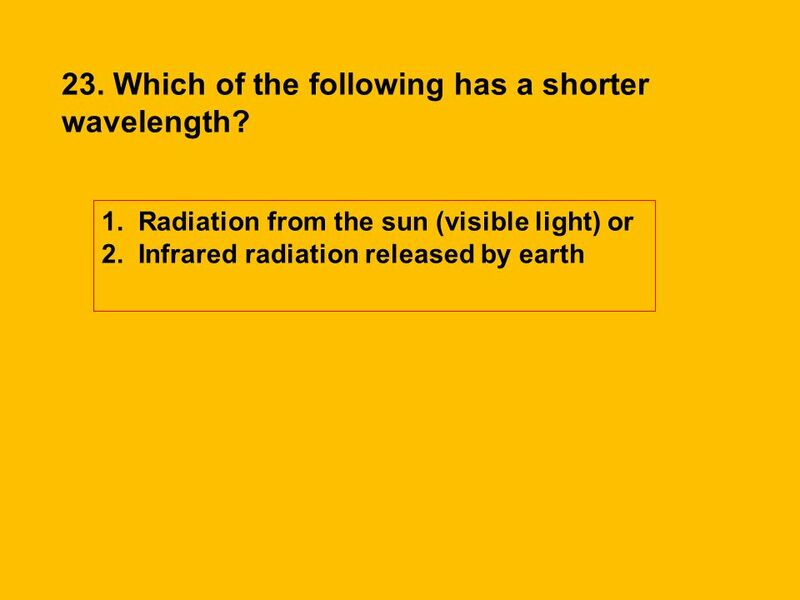 Which of the following has a shorter wavelength? 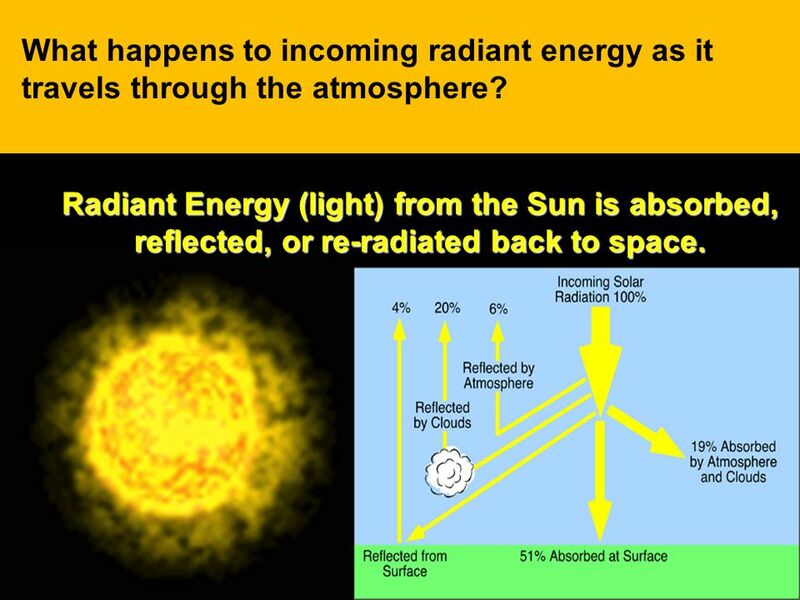 48 What happens to incoming radiant energy as it travels through the atmosphere? 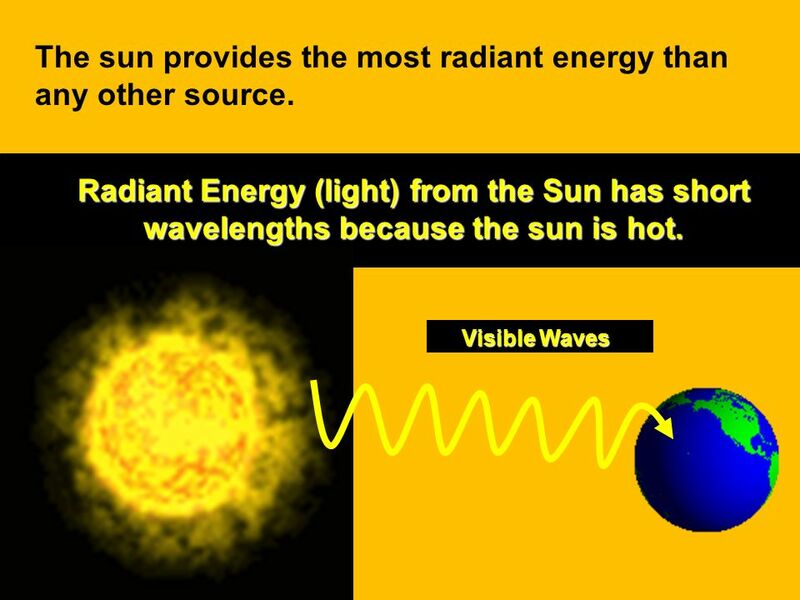 Radiant Energy (light) from the Sun is absorbed, reflected, or re-radiated back to space. 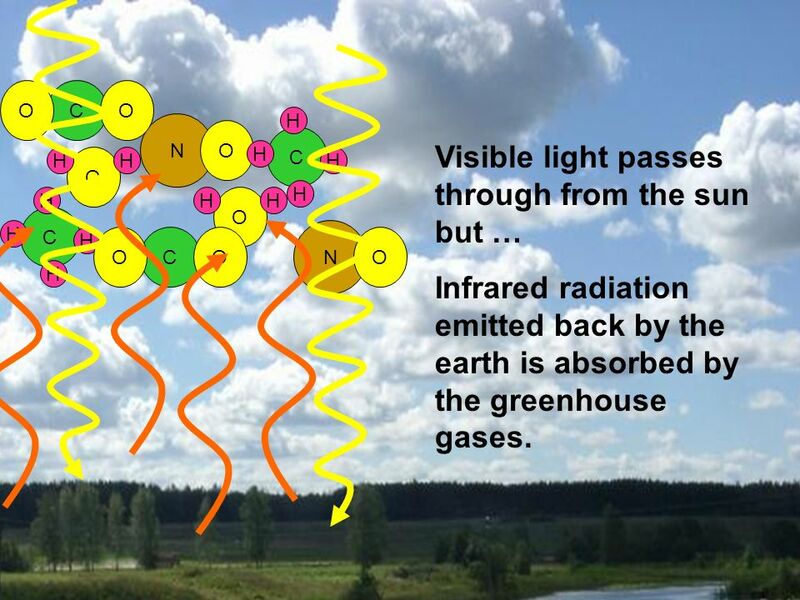 49 What happens to incoming radiant energy as it travels through the atmosphere? 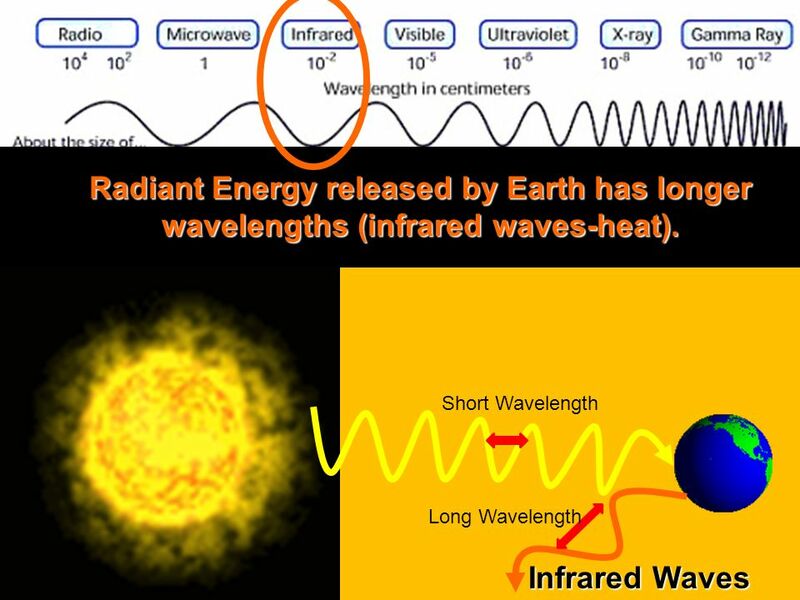 Radiant Energy (light) from the Sun is absorbed, reflected, or re-radiated back to space. 24. 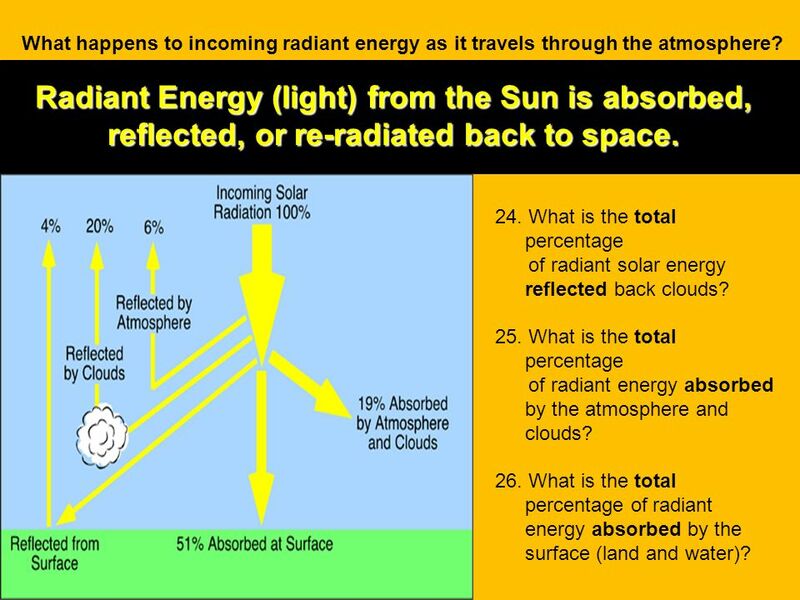 What is the total percentage of radiant solar energy reflected back clouds? 25. 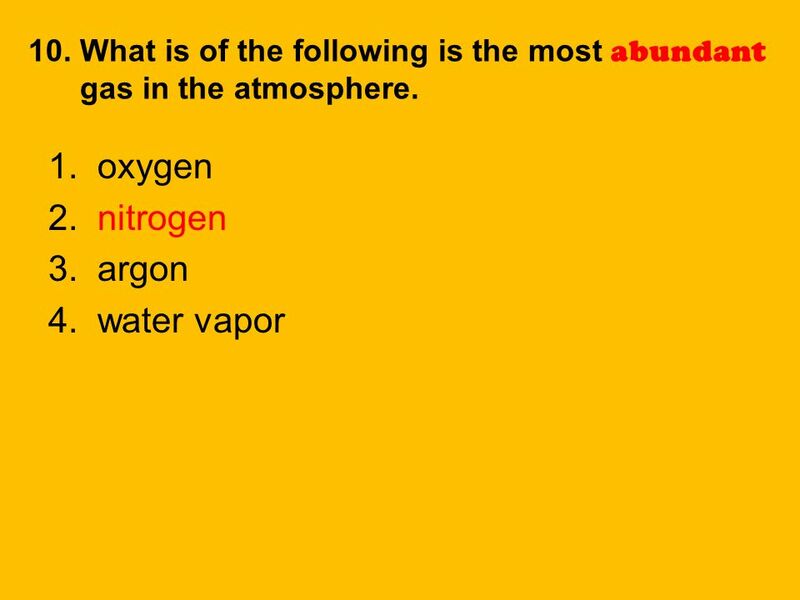 What is the total percentage of radiant energy absorbed by the atmosphere and clouds? 26. 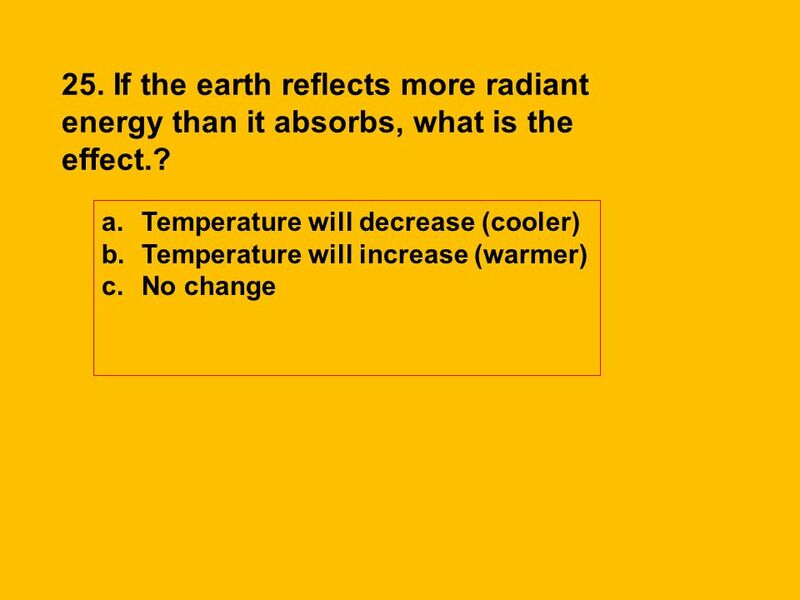 What is the total percentage of radiant energy absorbed by the surface (land and water)? 50 24. 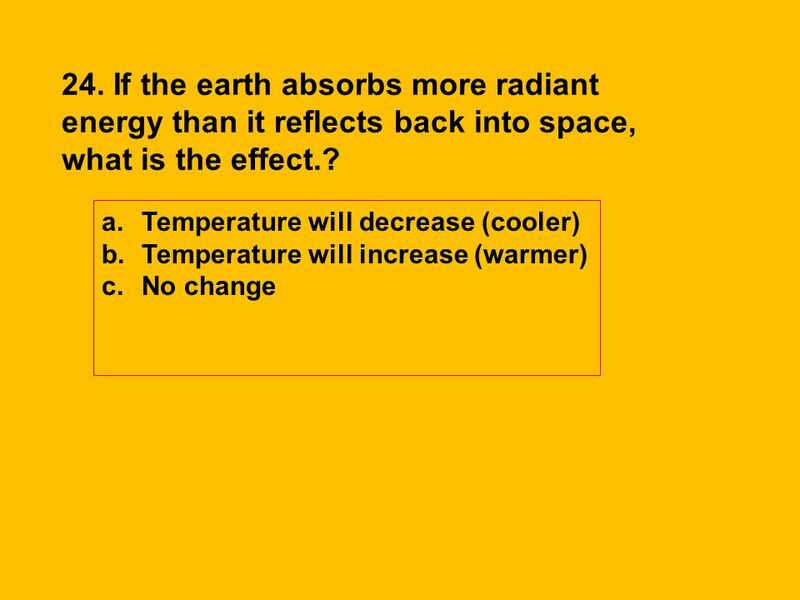 If the earth absorbs more radiant energy than it reflects back into space, what is the effect.? 51 25. 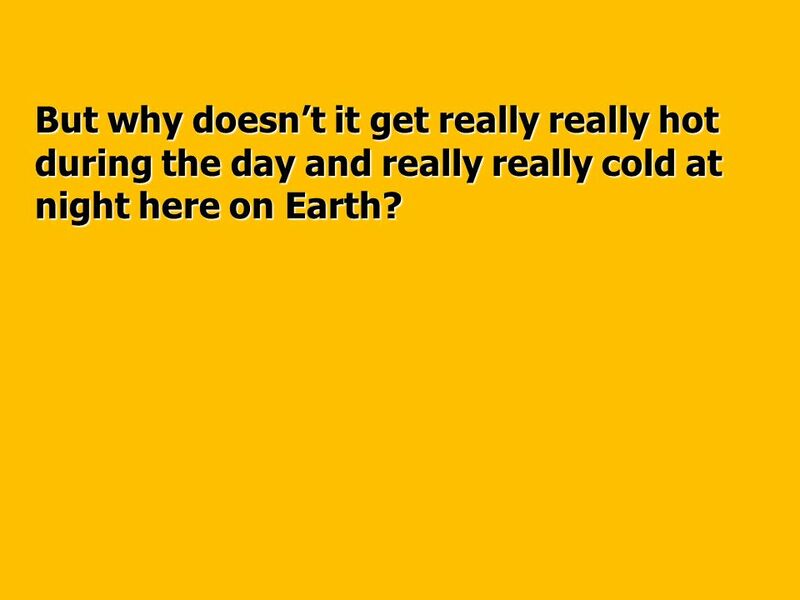 If the earth reflects more radiant energy than it absorbs, what is the effect.? 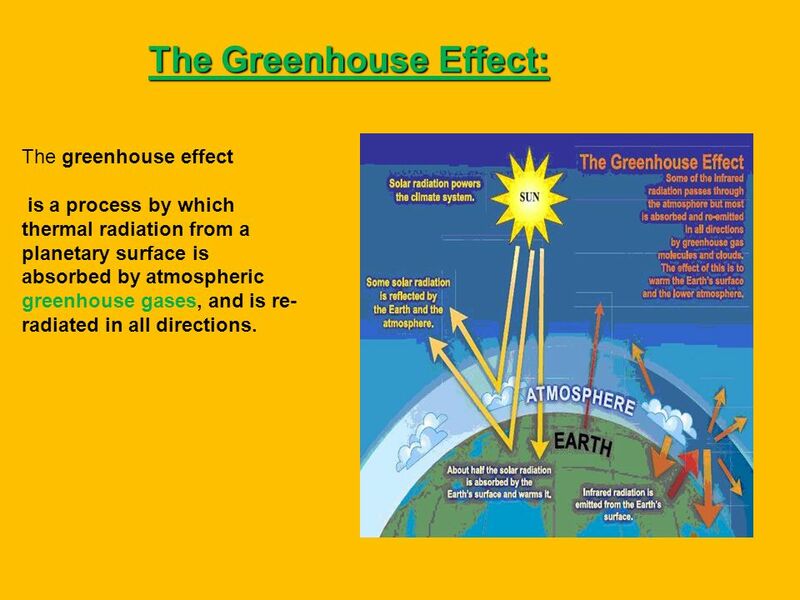 is a process by which thermal radiation from a planetary surface is absorbed by atmospheric greenhouse gases, and is re-radiated in all directions. 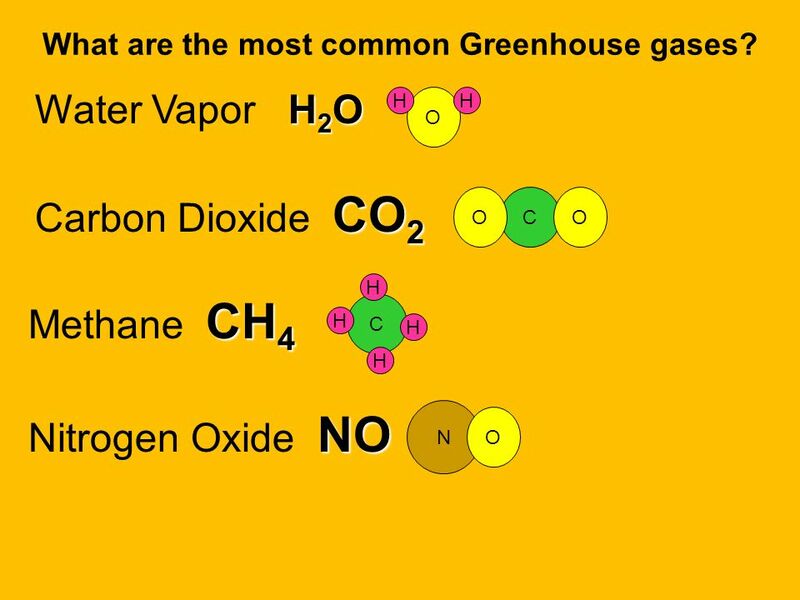 54 What are the most common Greenhouse gases? 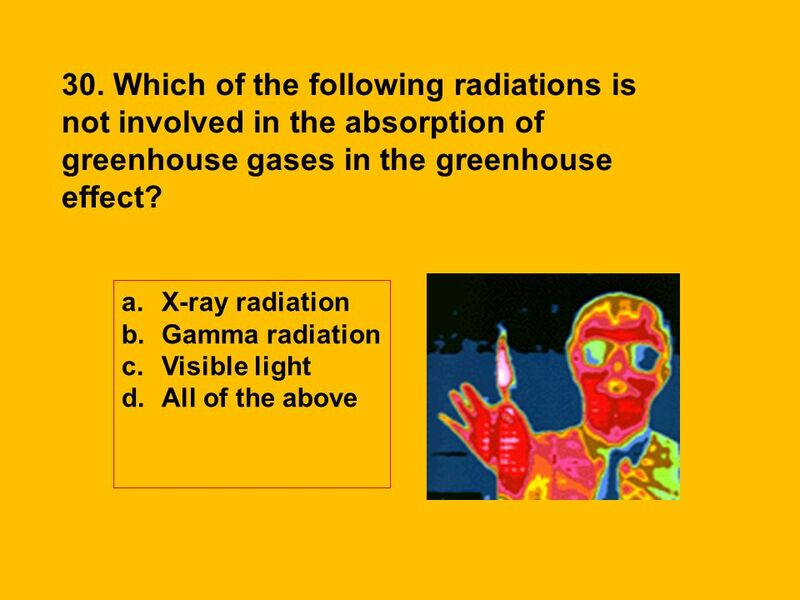 55 The greenhouse gases that absorb the most radiation are? 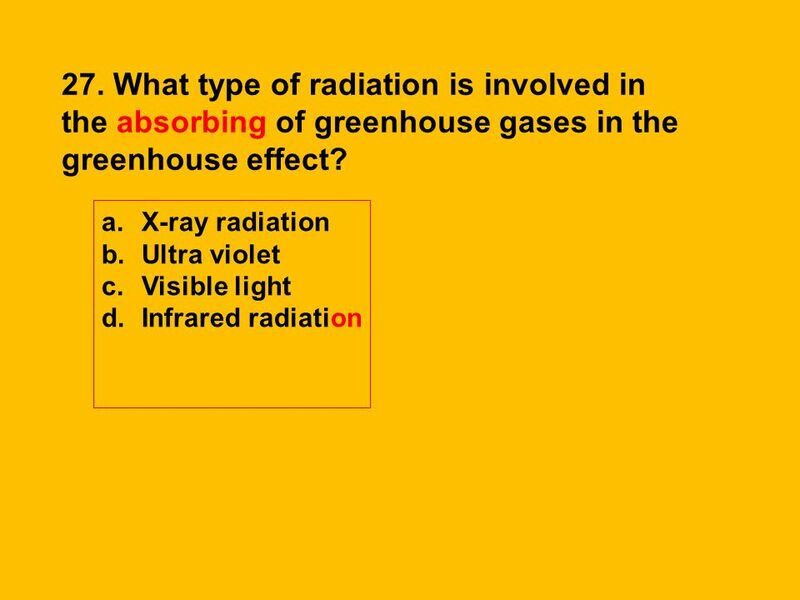 C O C H N O Visible light passes through from the sun but … Infrared radiation emitted back by the earth is absorbed by the greenhouse gases. 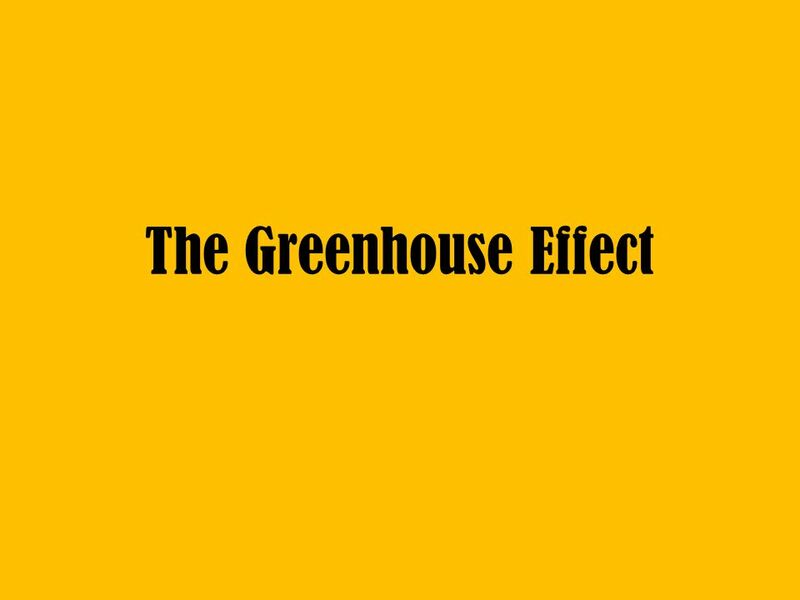 O H C H O H N O C O This is the Greenhouse Effect!!! 60 28. 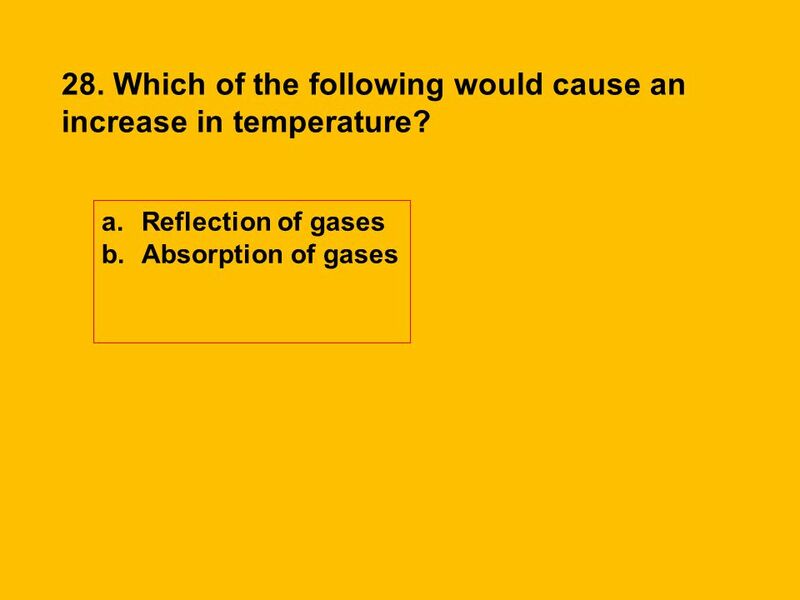 Which of the following would cause an increase in temperature? 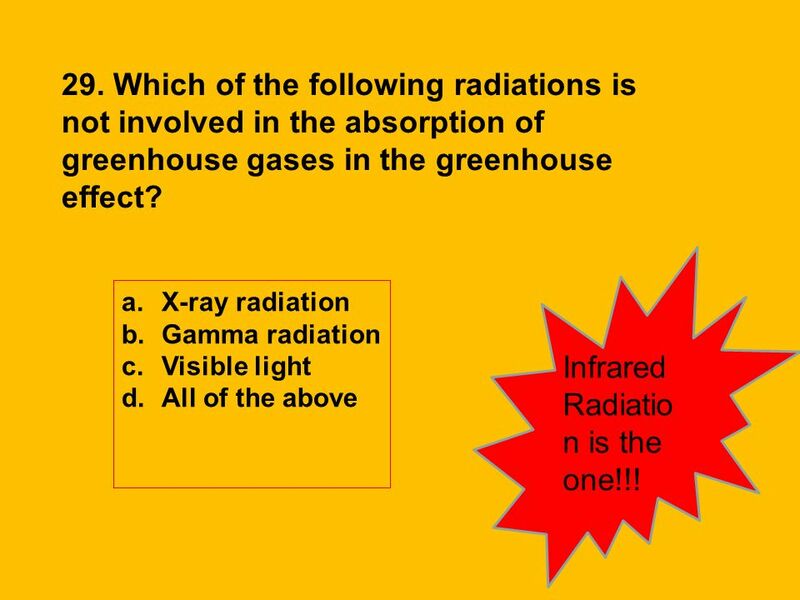 61 Infrared Radiation is the one!!! 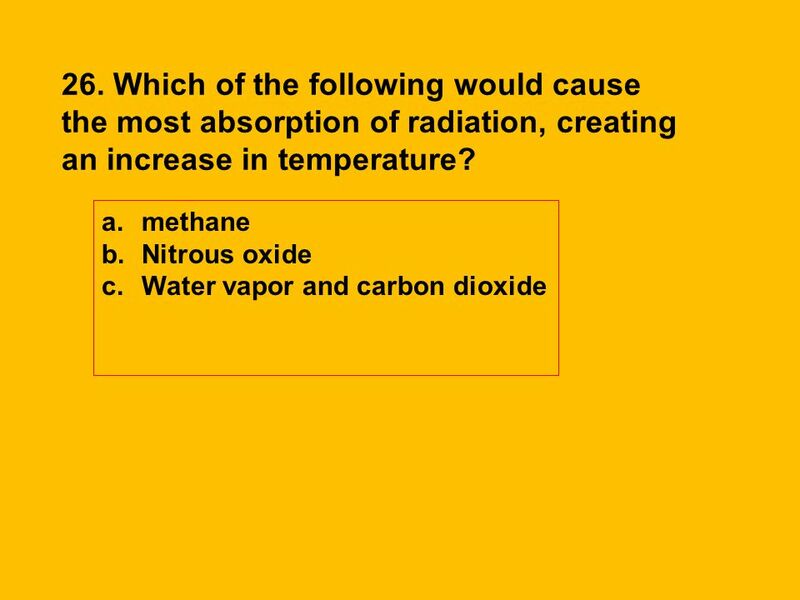 64 Putting more gases like carbon dioxide CO2, methane CH4, water vapor H2O, and pollutants in the air can absorb more and more infrared waves and make it warmer on Earth. 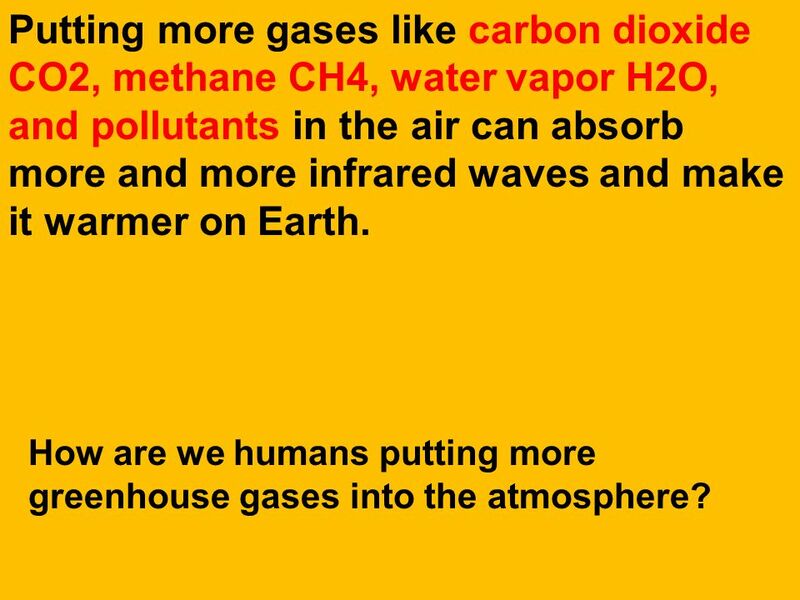 How are we humans putting more greenhouse gases into the atmosphere? 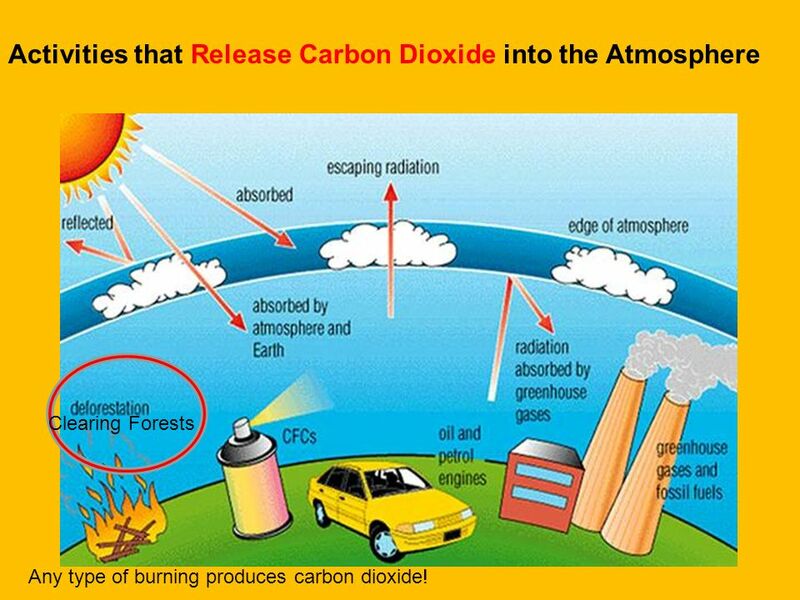 Clearing Forests Any type of burning produces carbon dioxide! 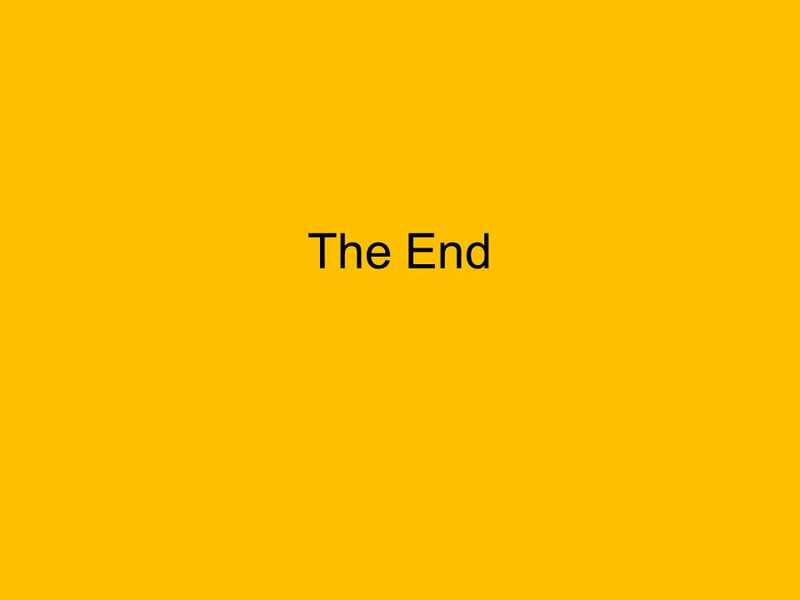 67 31. 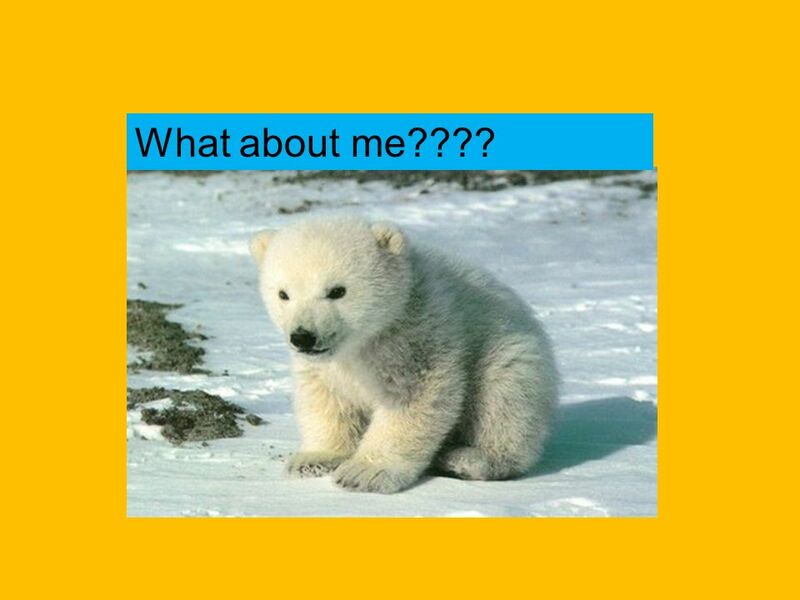 What are CFCs and what do they do? CFCs or Chlorofluorohydrocarbons are pollutants found in aerosol sprays and refrigerants such as refrigerators and air conditioners. 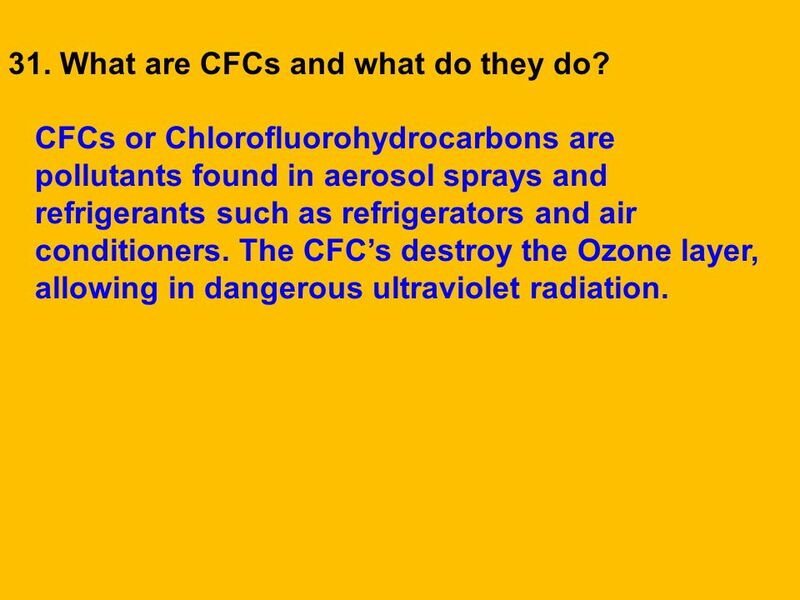 The CFC’s destroy the Ozone layer, allowing in dangerous ultraviolet radiation. 68 2 O3 → 3 O2 32. 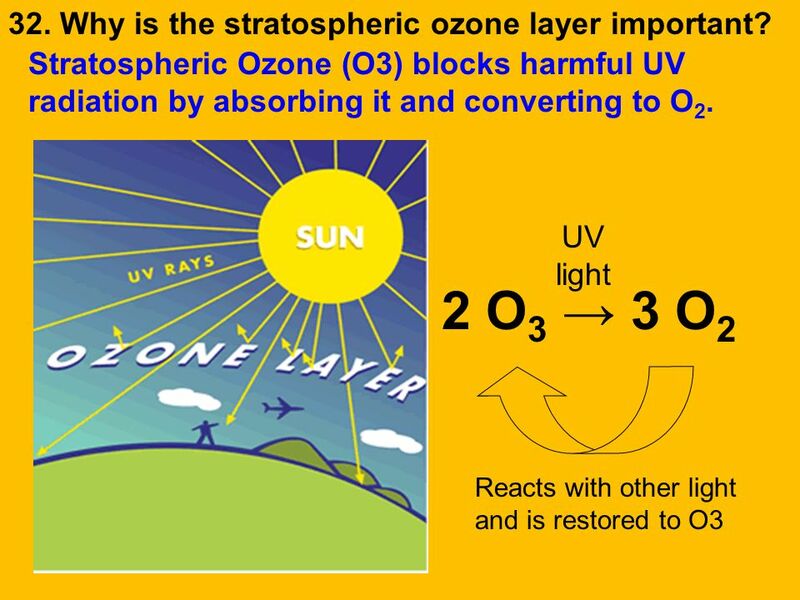 Why is the stratospheric ozone layer important? 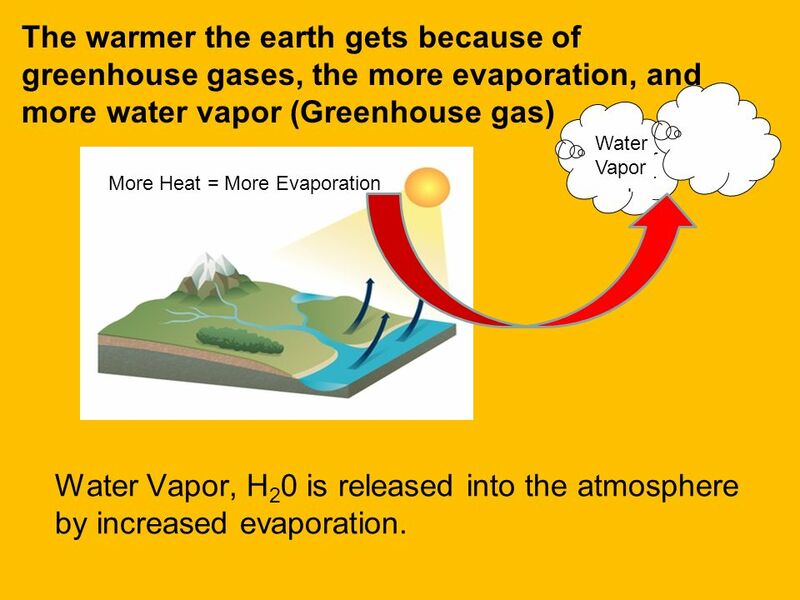 70 The warmer the earth gets because of greenhouse gases, the more evaporation, and more water vapor (Greenhouse gas) Water Vapor Water Vapor More Heat = More Evaporation Water Vapor, H20 is released into the atmosphere by increased evaporation. 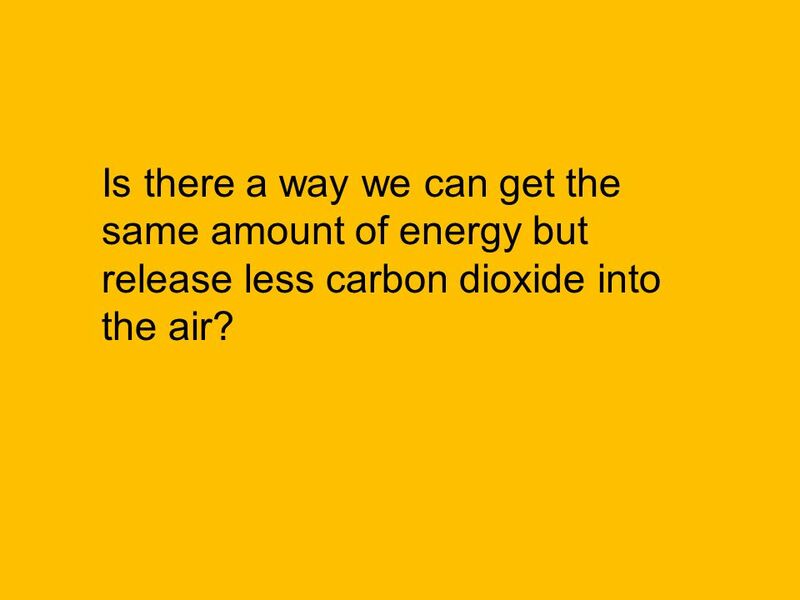 71 Is there a way we can get the same amount of energy but release less carbon dioxide into the air? 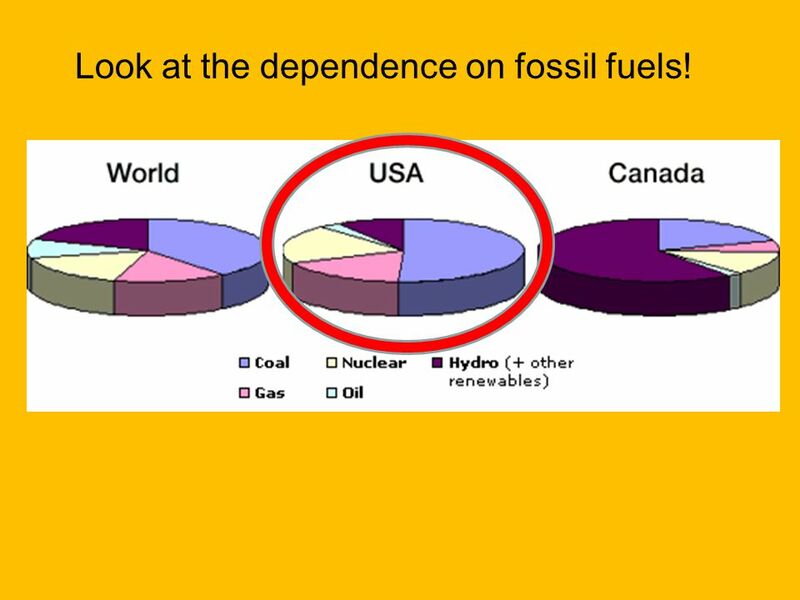 72 Look at the dependence on fossil fuels! 73 Look at where we need to cut back! 74 33. 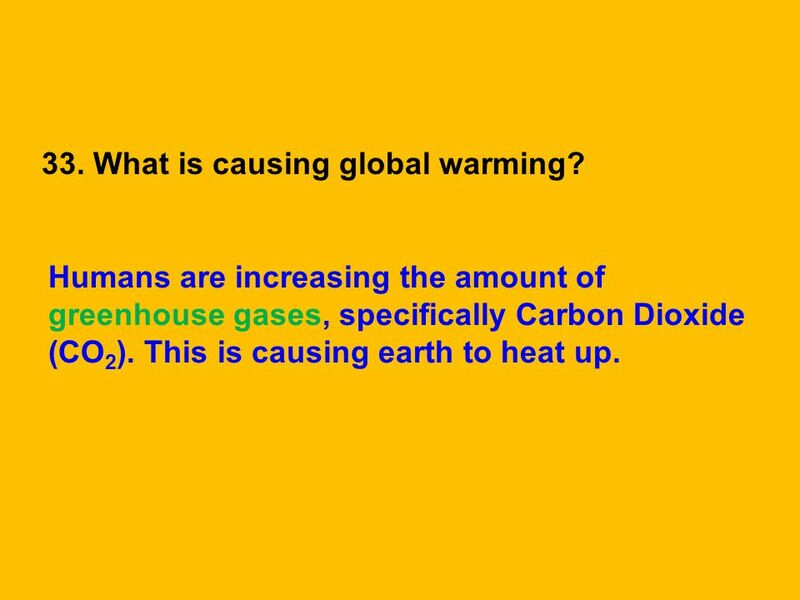 What is causing global warming? 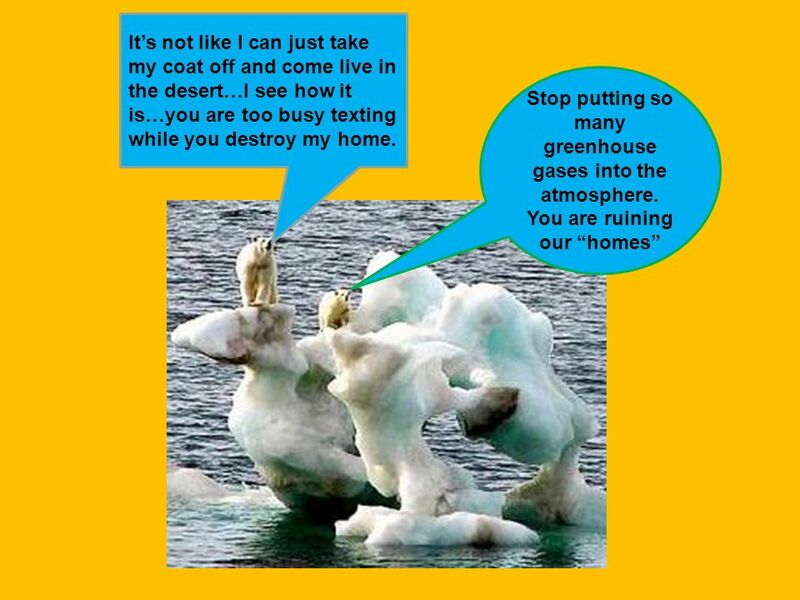 Humans are increasing the amount of greenhouse gases, specifically Carbon Dioxide (CO2). 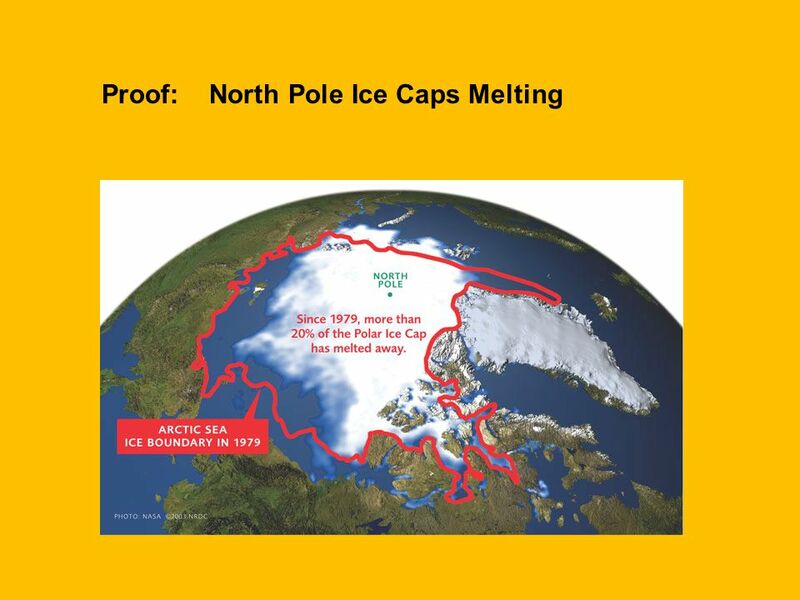 This is causing earth to heat up. 75 34. 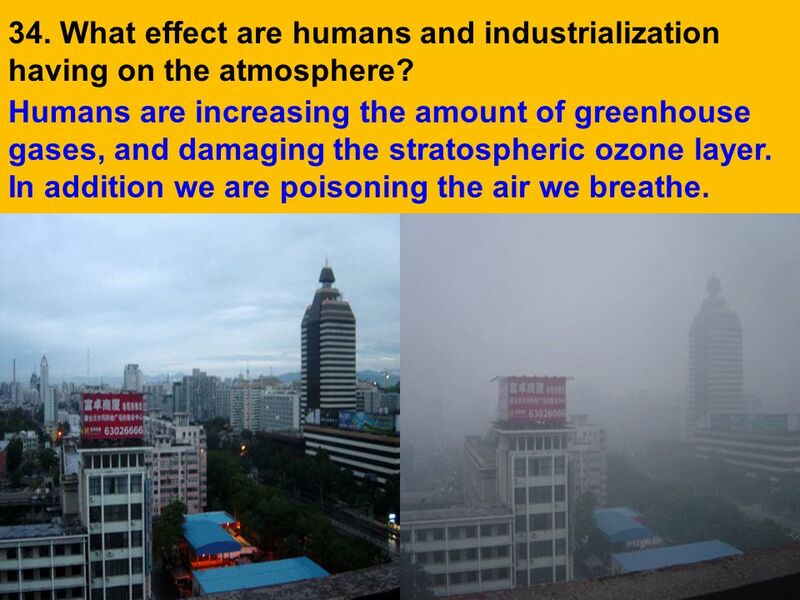 What effect are humans and industrialization having on the atmosphere? Humans are increasing the amount of greenhouse gases, and damaging the stratospheric ozone layer. In addition we are poisoning the air we breathe. 76 35. What is a temperature inversion and how does it affect air pollution? 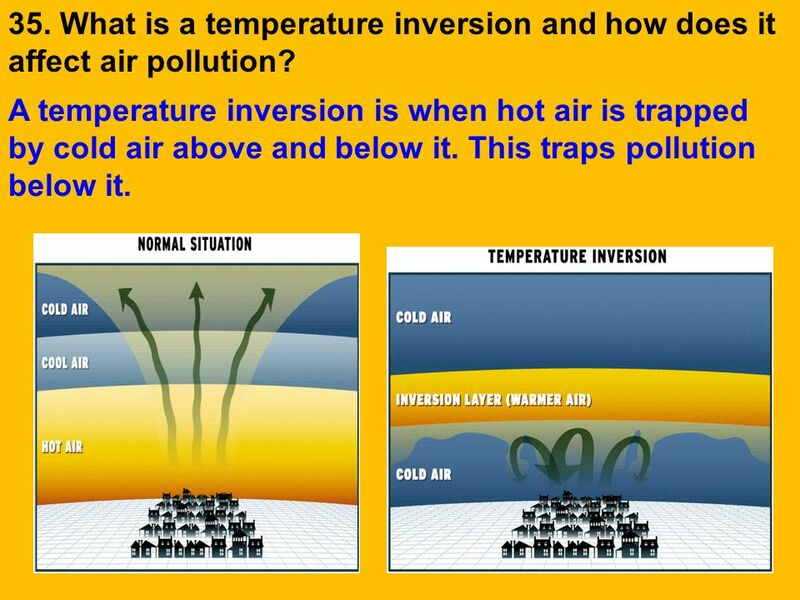 A temperature inversion is when hot air is trapped by cold air above and below it. This traps pollution below it. 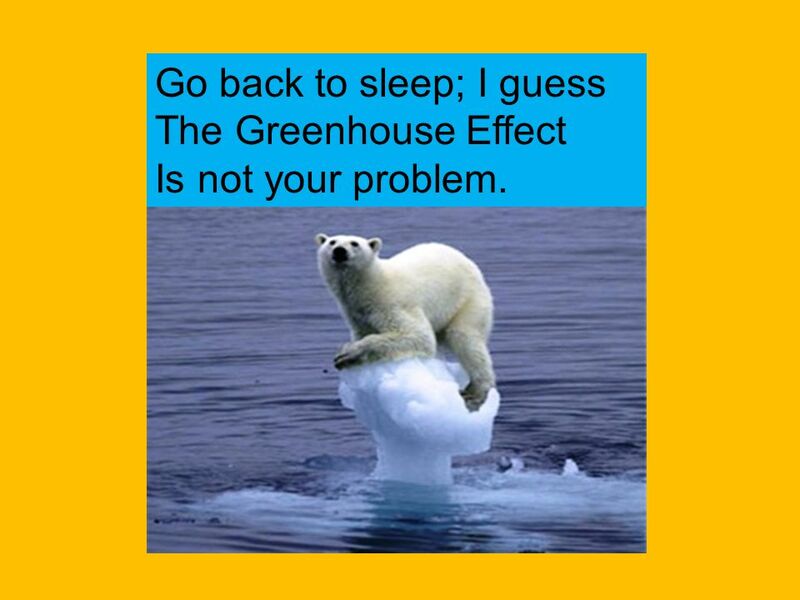 The Greenhouse Effect Is not your problem. 81 36. 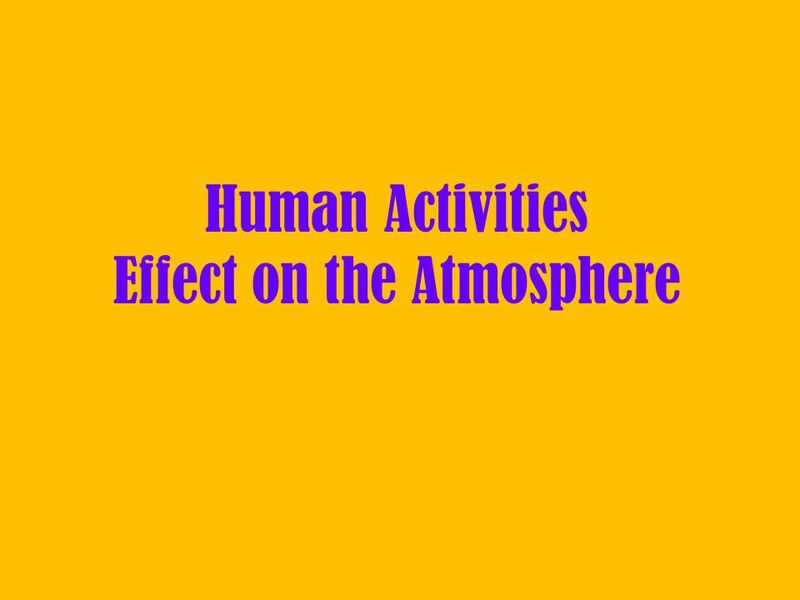 Why is our effect on the atmosphere important? The atmosphere is very thin, and delicate. It is also very necessary for life, if we destroy it we will die. 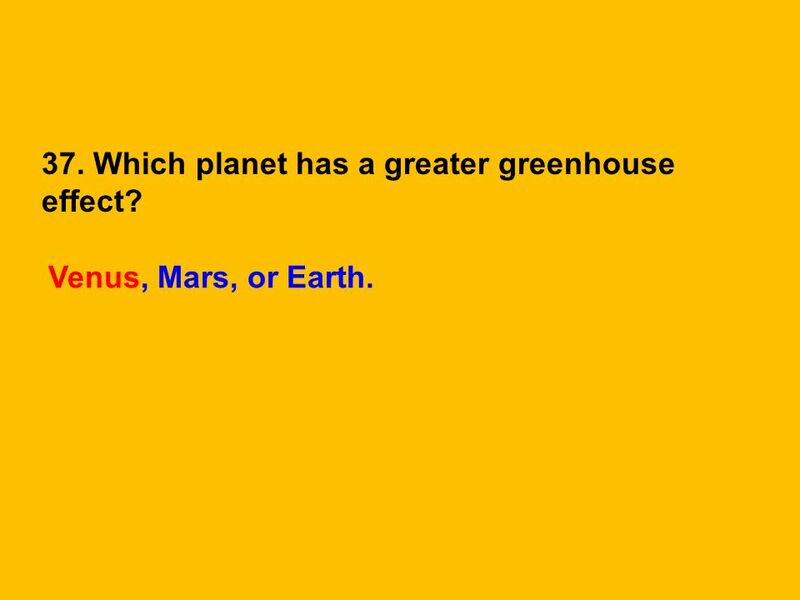 82 Do other Planets have a Greenhouse Effect? 83 Venus and Mars have it too! Yup! 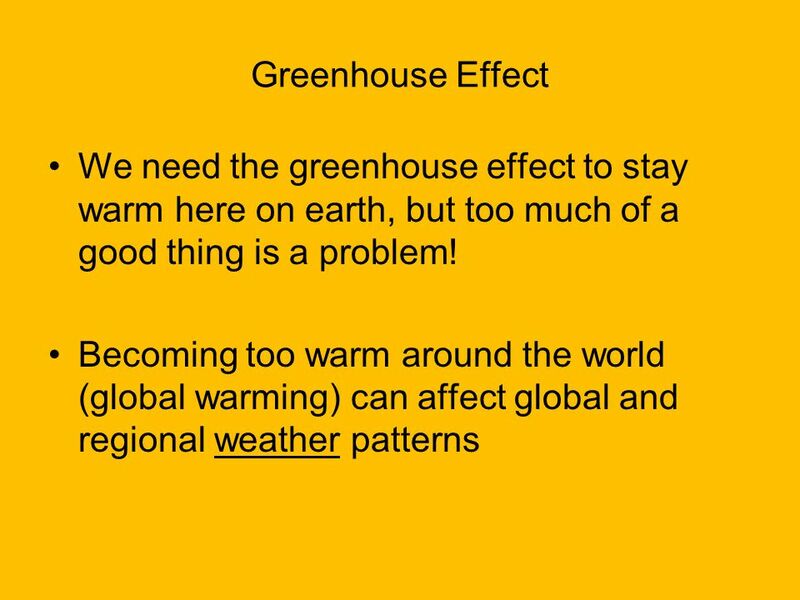 The greenhouse effect is not just found on Earth!!! 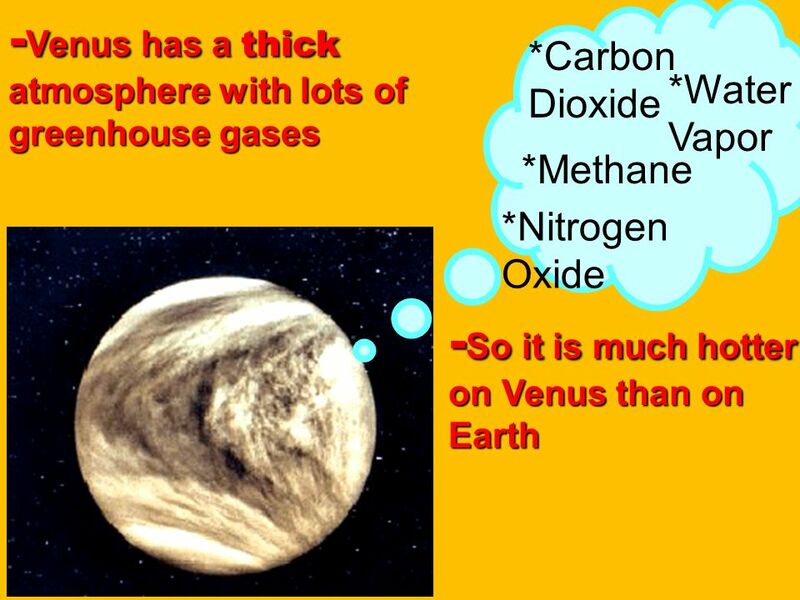 Venus and Mars have it too! 86 37. 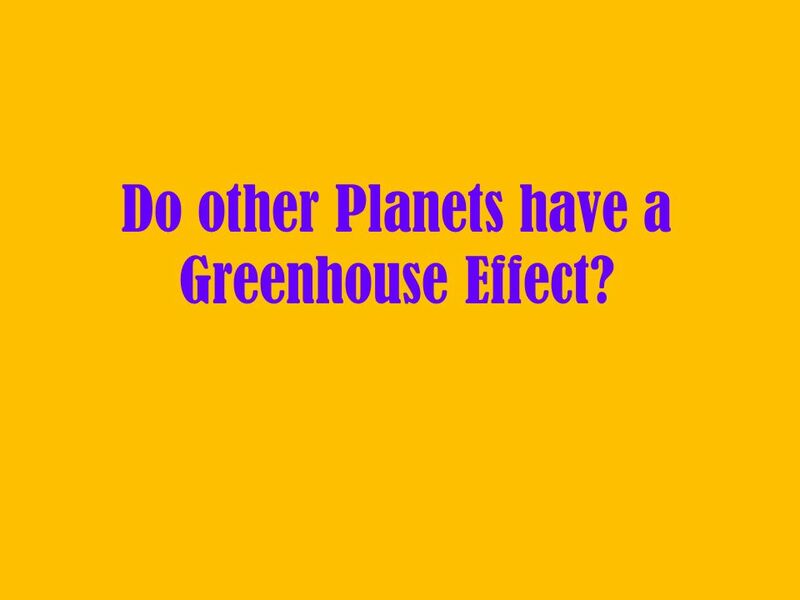 Which planet has a greater greenhouse effect? 87 But why doesn’t it get really really hot during the day and really really cold at night here on Earth? 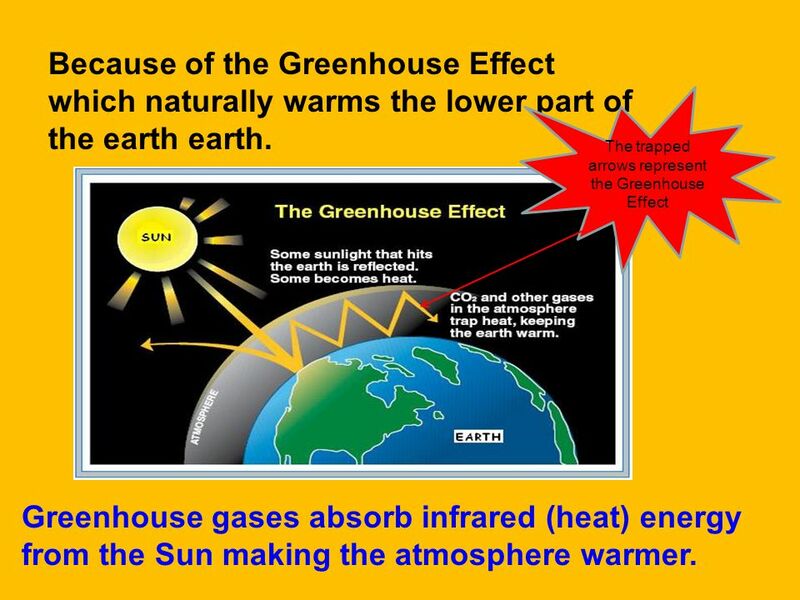 Because of the Greenhouse Effect which naturally warms the lower part of the earth earth. 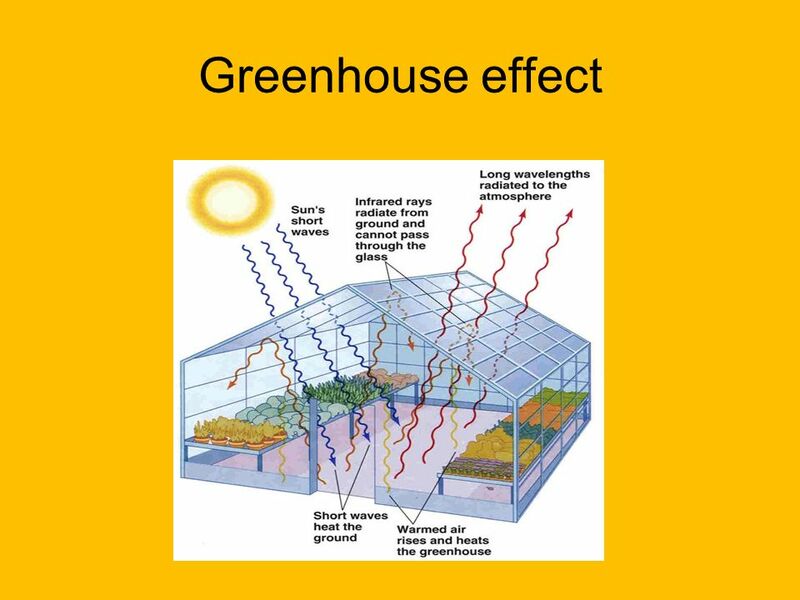 The trapped arrows represent the Greenhouse Effect Greenhouse gases absorb infrared (heat) energy from the Sun making the atmosphere warmer. 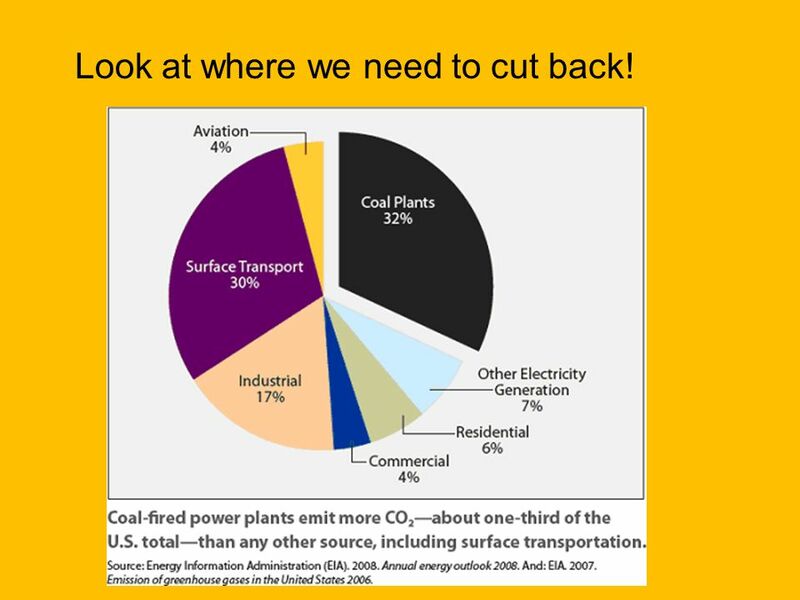 Download ppt "CST Review Standard 4 Energy enters the Earth system primarily as solar radiation and eventually escapes as heat. Know the relative amount of incoming." 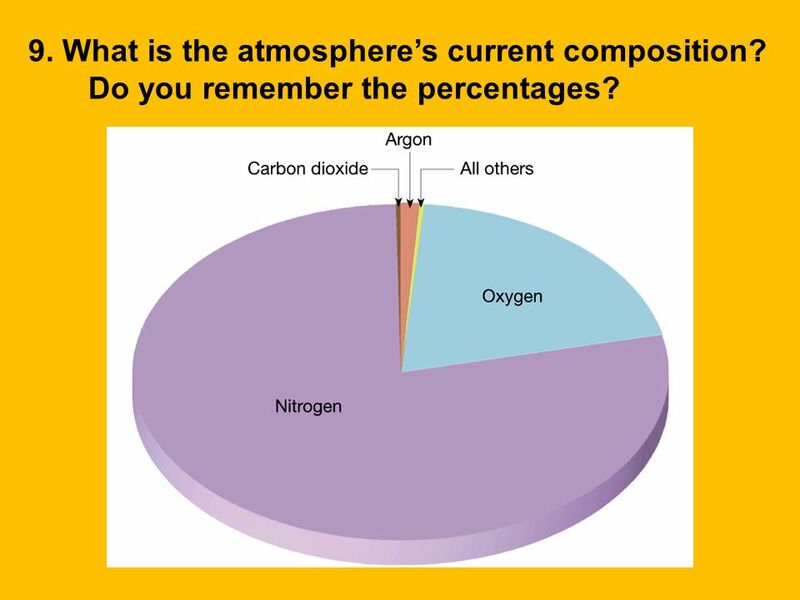 What gas makes up 78% of our atmosphere? 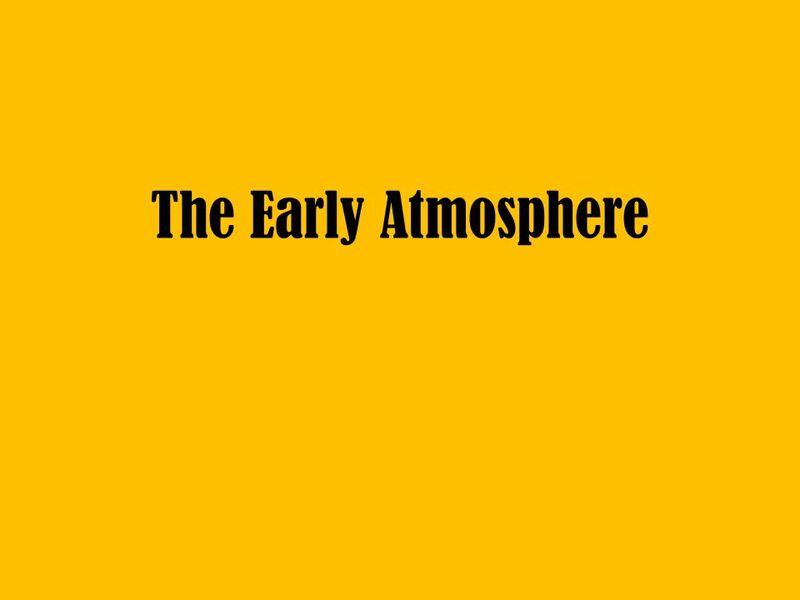 Earth’s atmosphere Chapter 1 Section 1. 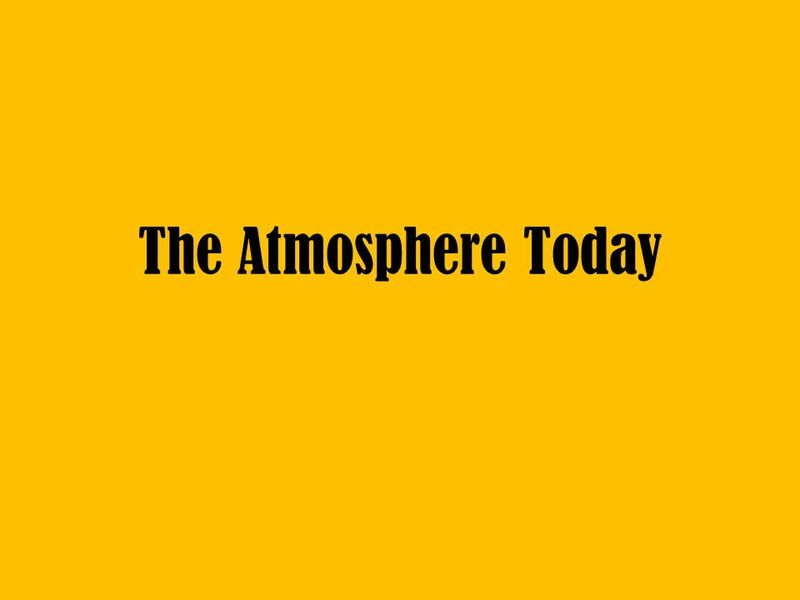 Atmosphere 15.1 – Earth’s Atmosphere.  Extends from the Earth’s surface to outer space.  About 900 km (560 miles)  Mixture of gases, solids, and liquids. 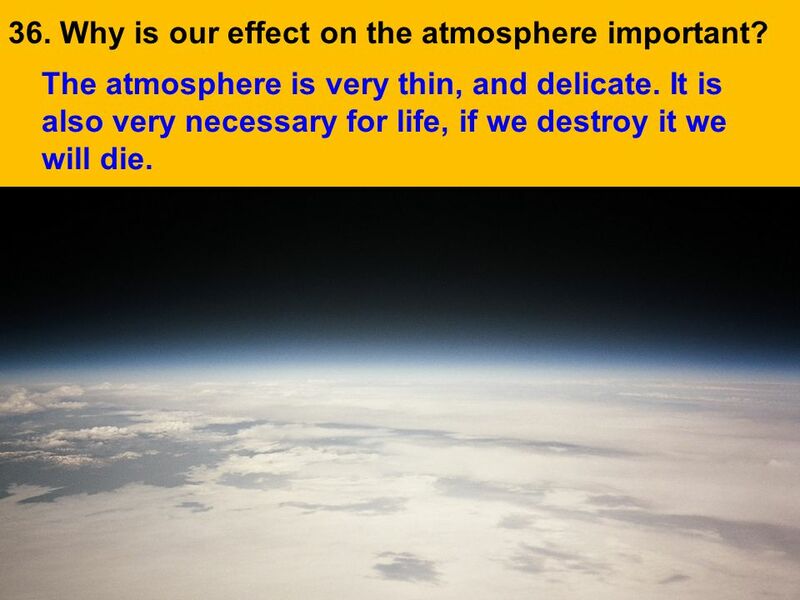 Objectives Describe the composition of Earth’s atmosphere. 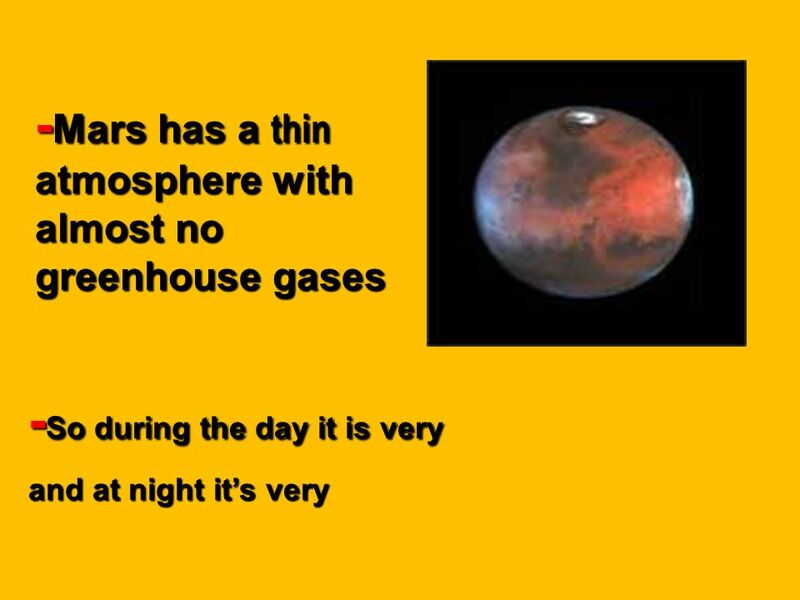  The atmosphere is a layer of gases that surround the Earth. 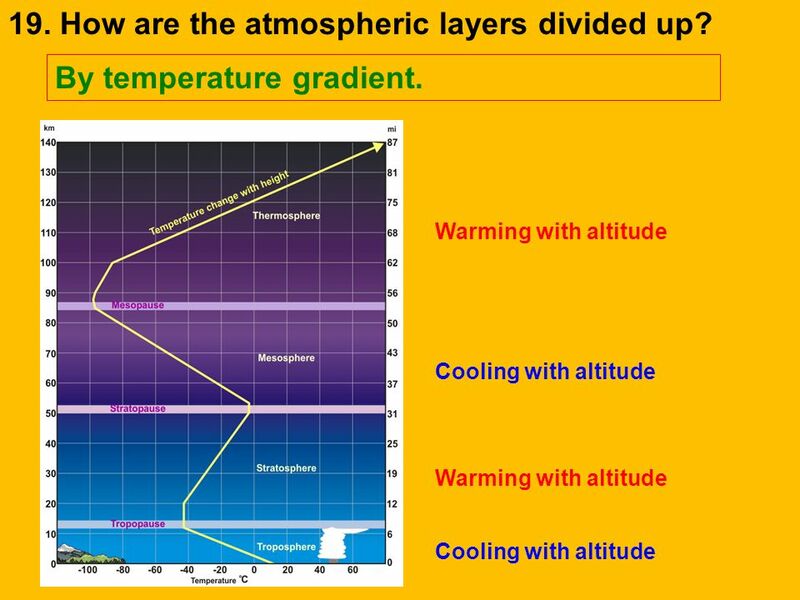  These layers differ in temperature, in density, and in the relative amounts of the different.